August « 2013 « How Do You Measure 525600 Minutes? 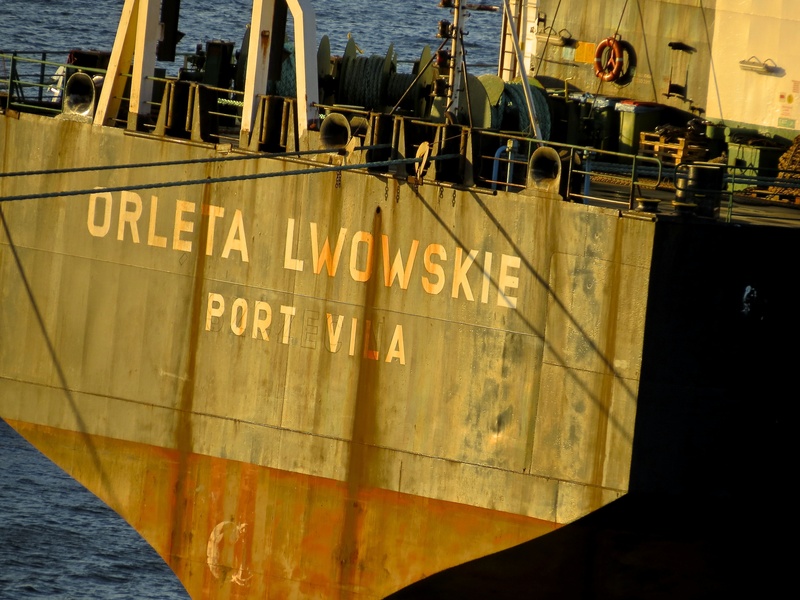 A ship sailing near the Polish port of Gdynia. 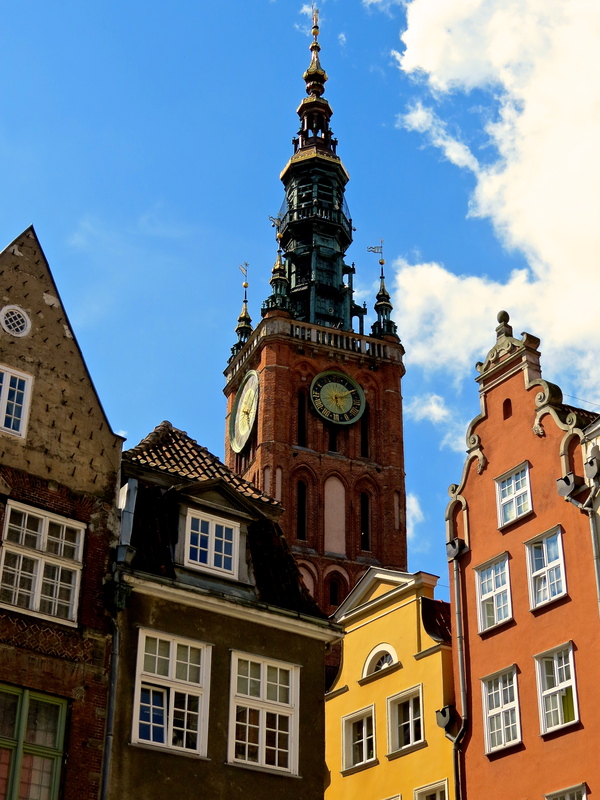 In all the excitement and anticipation of going to Stutthof in the morning, I’d totally forgotten we were going to Gdansk for a quick tour in the afternoon. Our actual port city on this stop was Gdynia. We didn’t really see much of it though, except passing through on the bus. What I did see of it, appeared to be a fairly modernized city, even though its history dates back to the 1770s. 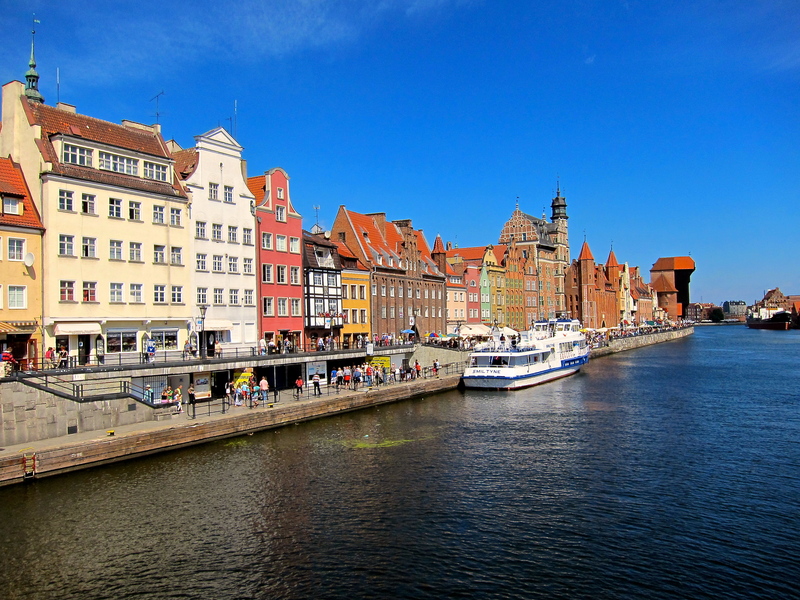 Gdansk, also known as Danzig, is a beautiful European city. Full of historical charm, I found it to be much of what I expected from an older. European city– and more. The Royal Route in Gdansk. 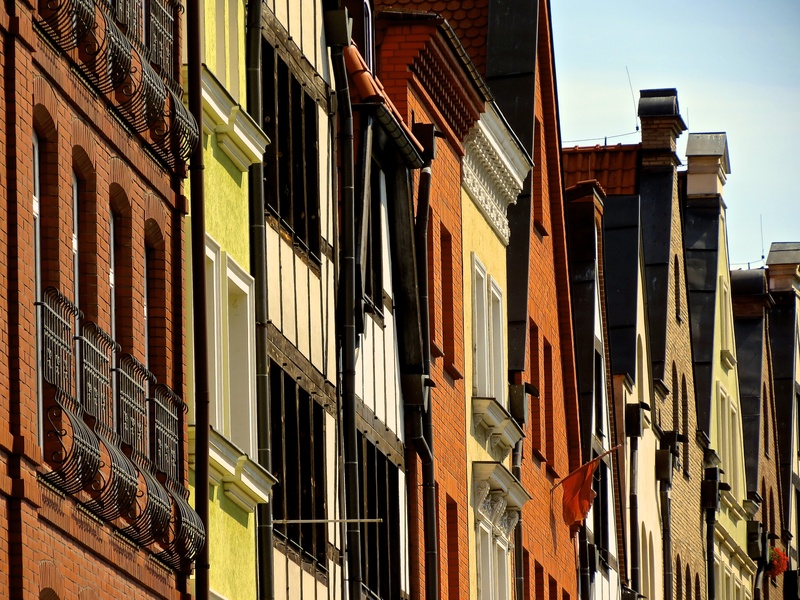 I love the color and lines of the buildings in Gdansk. 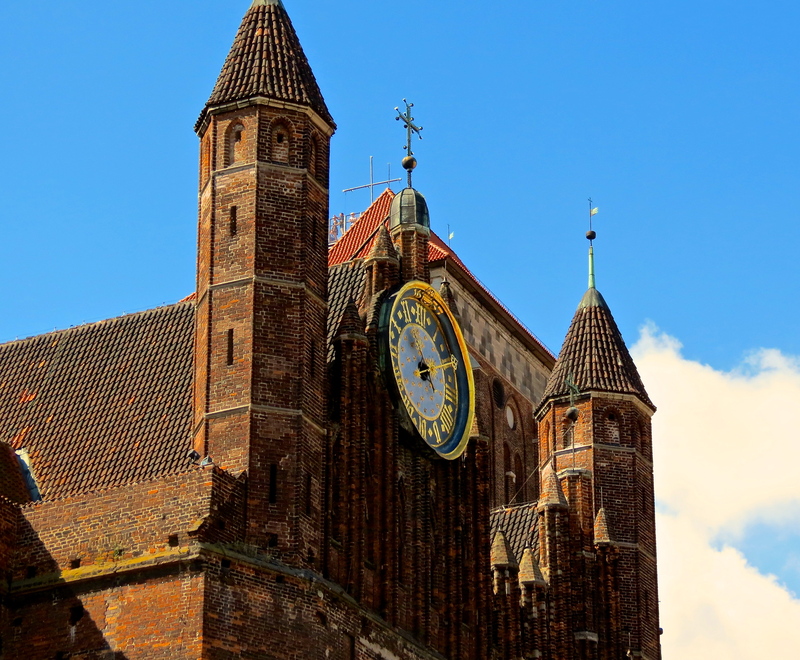 The city dates back to the 10th century, having been both a part of Poland and part of Germany over its complex history. It is also known as the birthplace of the Solidarity movement, which led the fight to end Communism in Central Europe. 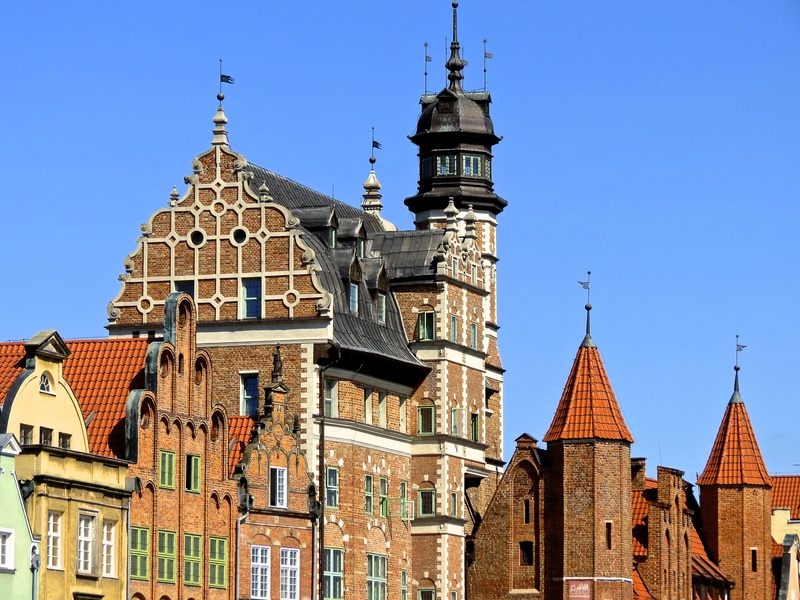 Gdansk, combined with the cities of Gdynia and Sopot have become a metropolitan area known as Tricity. We had an advantage here. Since this was a private tour, our guide got us oriented as to where we were and pointed out interesting landmarks and then let us go out on our own to explore. 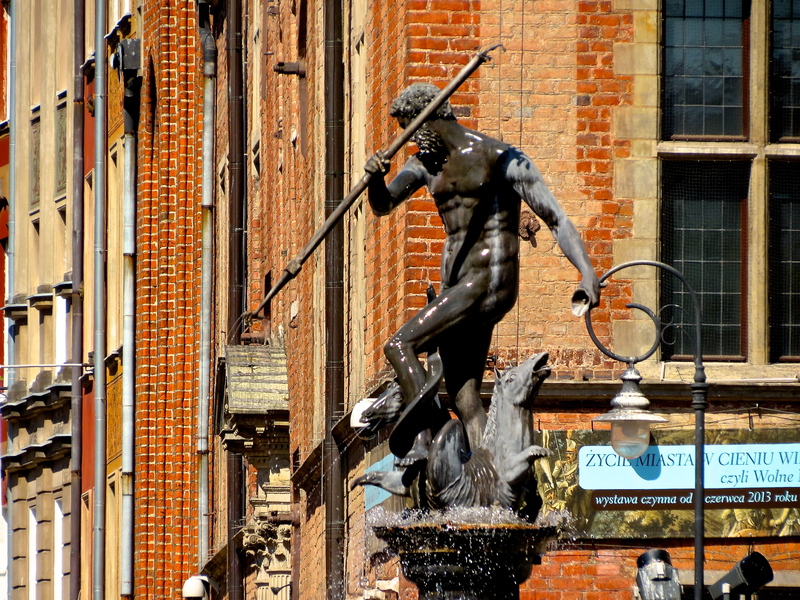 On Long (Market) Street, we saw the rather famous Neptune Statue, created in 1617 by architect Abraham van den Blocke. Then we visited St. Mary’s Church, which is the largest brick church in the world. The clock of St. Mary’s Church. 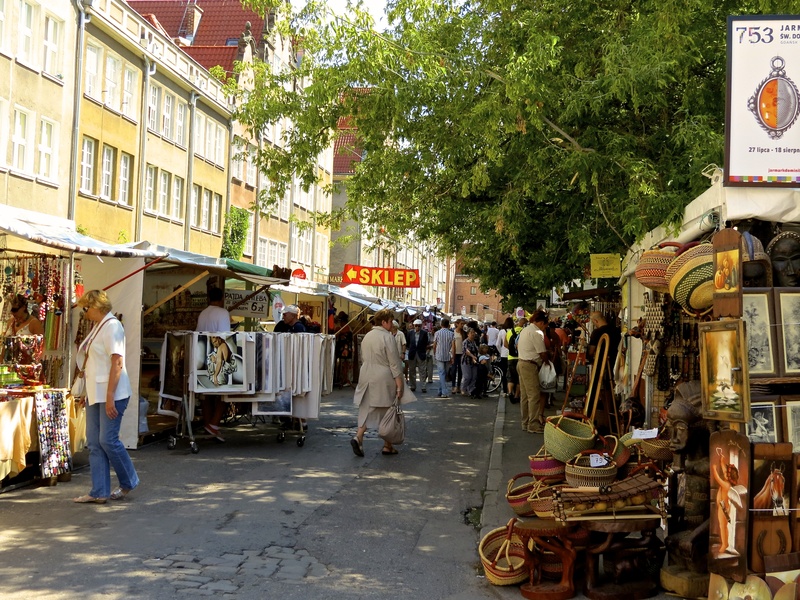 This time of year, the streets of Gdansk become a festive open air market with hundreds, if not thousands of vendors selling everything from clothing and art to wine and sausages. 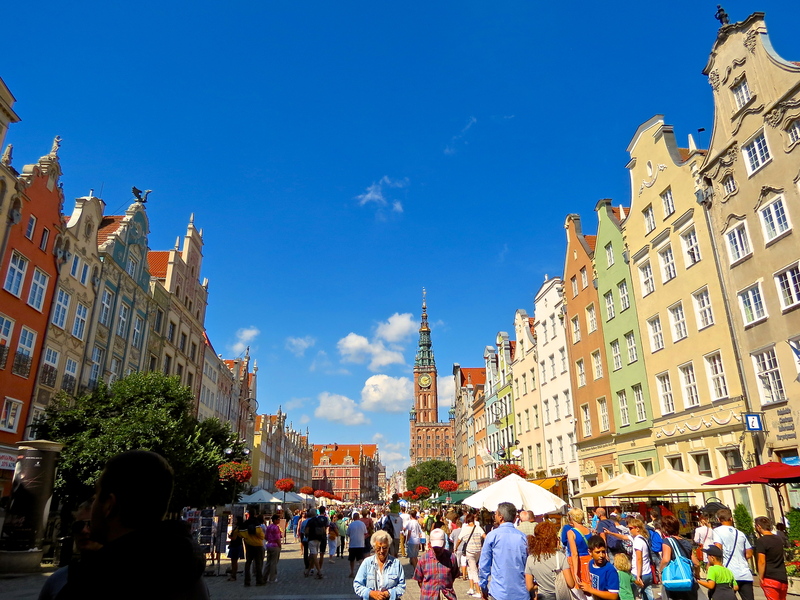 The seasonal open air market in the streets of Gdansk. I could have spent a whole day just wandering through the streets, sampling all the magnificent food offerings and shopping the unlimited variety of merchandise for sale. Many of the streets were crowded but there was no rush. It was a very relaxing atmosphere. Stunning historic architecture around every corner. We walked to City Hall, saw the Town Hall Tower as well as many other points of interest before returning to the bridge at the Motlawa river where we rejoined our small group. Such a beautiful, clean city. I could easily spend several days here relaxing and exploring. 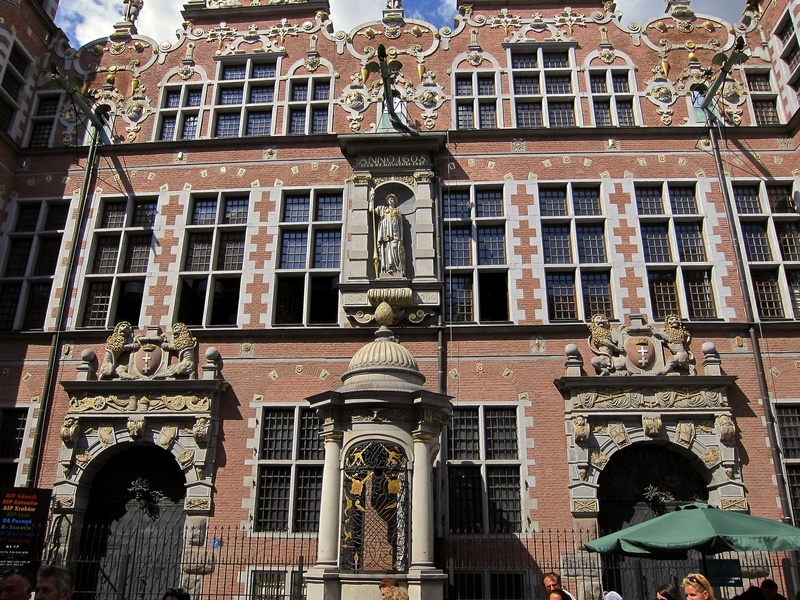 The Town Hall Tower rising about the city of Gdansk. The Motlawa River. In the distance (right) you can see the medieval Gdansk Crane. I’d like to extend a very special thanks to Judy Perl of Judy Perl Worldwide Travel (NYC) for making this incredible day possible. It’s hard to know where to even start this post. I have so much I want to say– that to include it all in one post would be impossible. 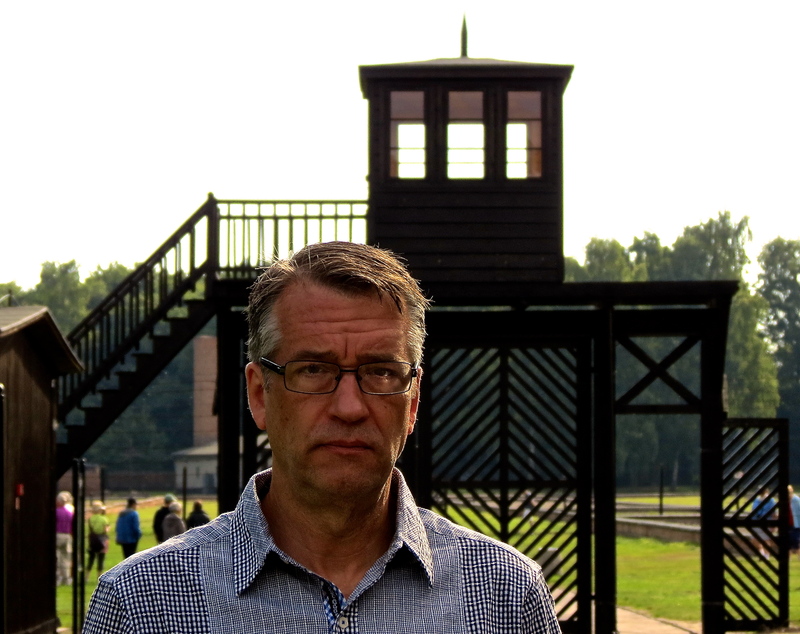 I’m going to try to keep this post focused on our visit to Stutthof, itself; and I’ll follow up later with a more personal post about my feelings on the subject of the Holocaust and my commitment to the importance of retelling the horrific story that can not and should not be forgotten. I must say here that my involvement in education about the Holocaust began nearly twenty years ago with a play adaptation I wrote, that in subsequent years, has been performed for more than 25,000 students. I had to visit here. I had to witness it with my own eyes. 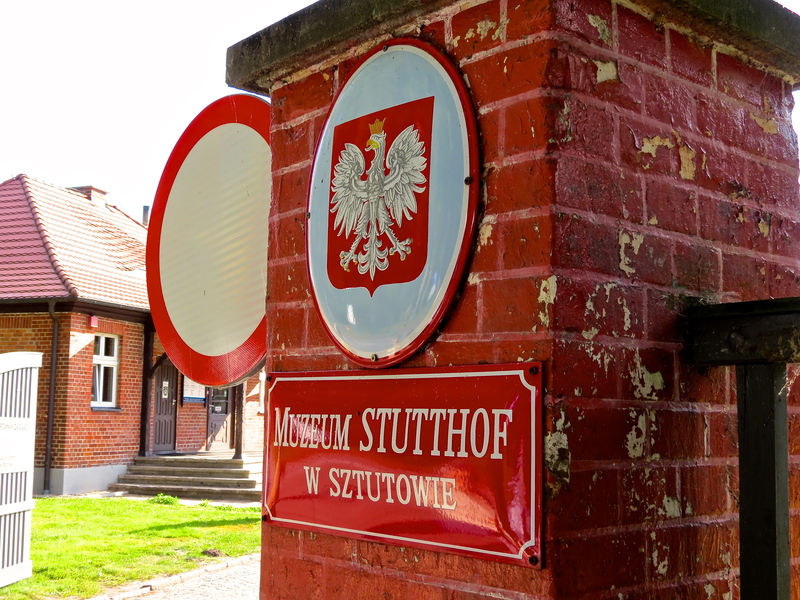 Entrance to the Stutthof Museum. Michael was able to arrange a private tour to the Stutthof Museum through our travel agent way in advance of our trip. On past Regent cruises, it had been offered as an excursion but it was not on the itinerary for our cruise. Our travel agent, Judy Perl, whose family was also on the cruise, thought the prospect of going would be a good experience and asked if we minded if her family joined us. We readily accepted. 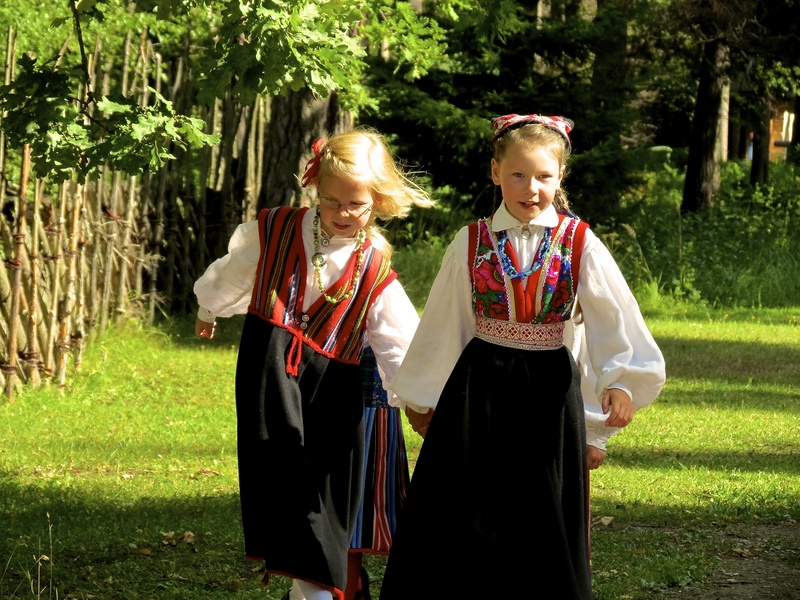 So that morning, our party of seven, boarded a mini bus for Stutthof. 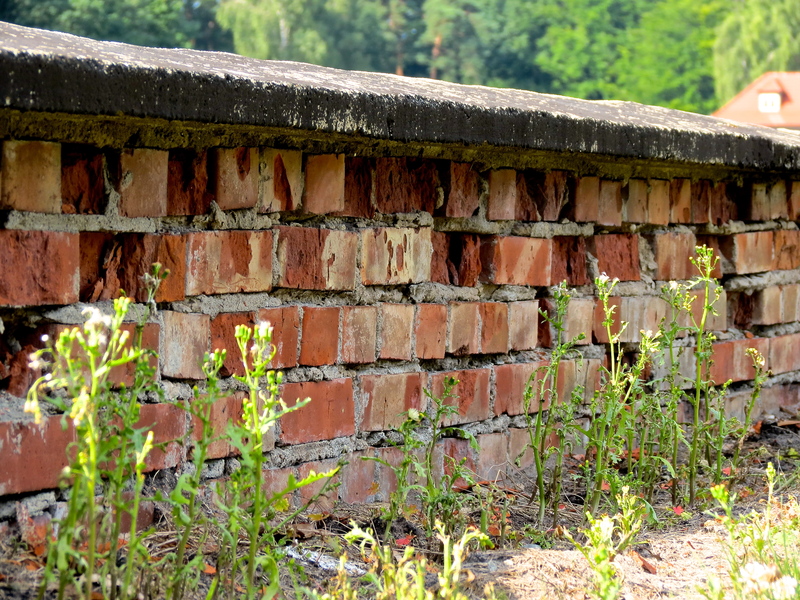 Outside the Stutthof Concentration Camp. In 1939, the Stutthof Concentration Camp was built in the former Free City of Danzig territory, 34 km (21 miles) from Danzig (now, Gdansk). It is now known as the Stutthof Museum or Muzeum Stutthof w Sztutowie. 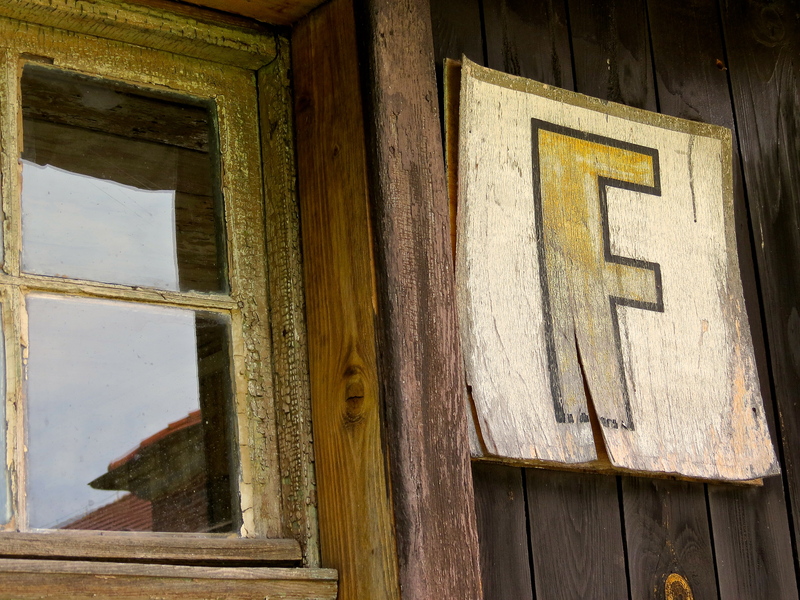 Stutthof was the first camp built outside of German borders and was the last camp to be liberated in May 1945. It was originally intended to house Polish undesirables as an internment camp but in 1941 became a labor camp. In early 1942 it became a concentration camp. 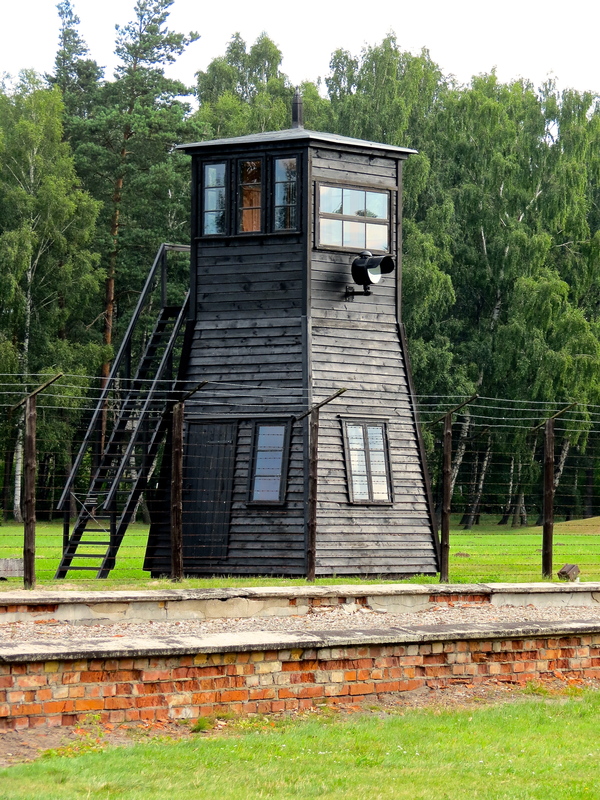 It is believed that approximately 110,000 Poles and Jews from all over Europe were sent here. 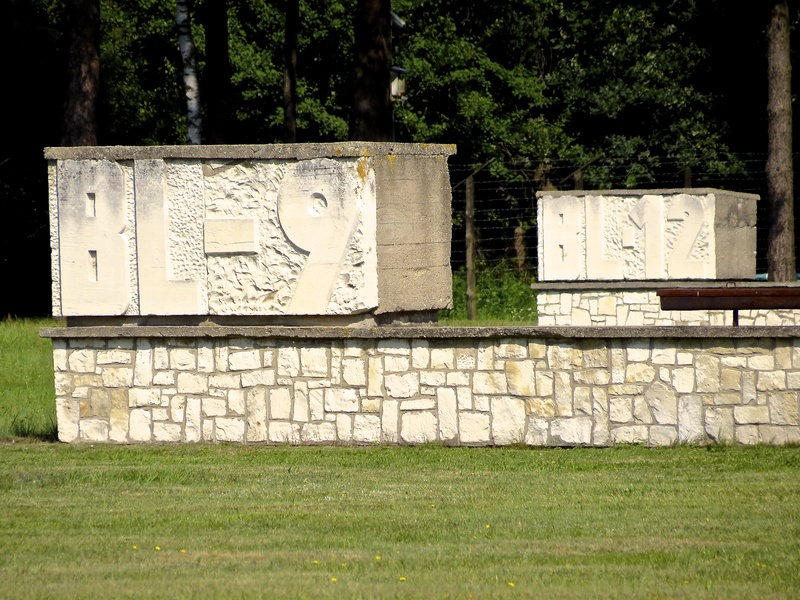 The crematory and gas chamber were built in 1943, used primarily to execute patriotic Poles. In June 1944, they were used for Jewish executions as part of Hitler’s Final Solution. The building where new arrivals were processed. The original, old camp had only eight barracks but was then expanded with many more barracks as part of the new camp. 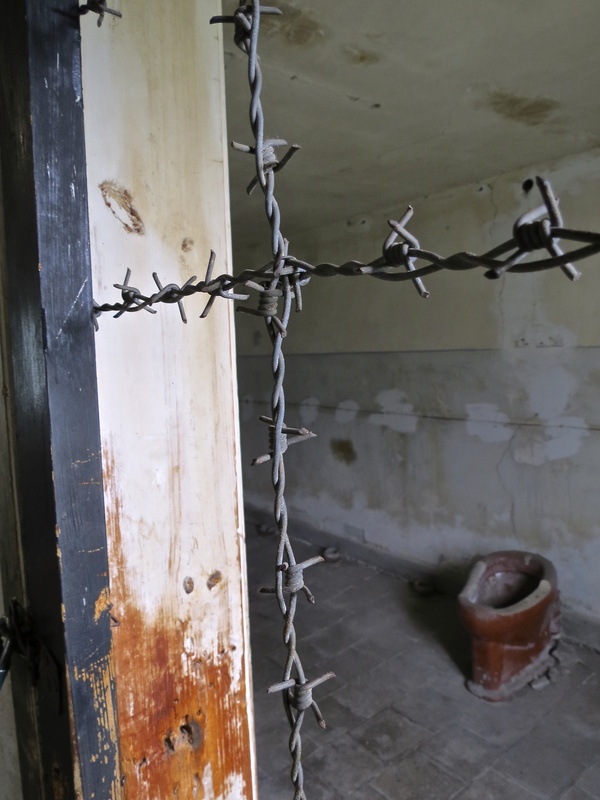 Surviving documents show people from at least 28 countries were imprisoned here. 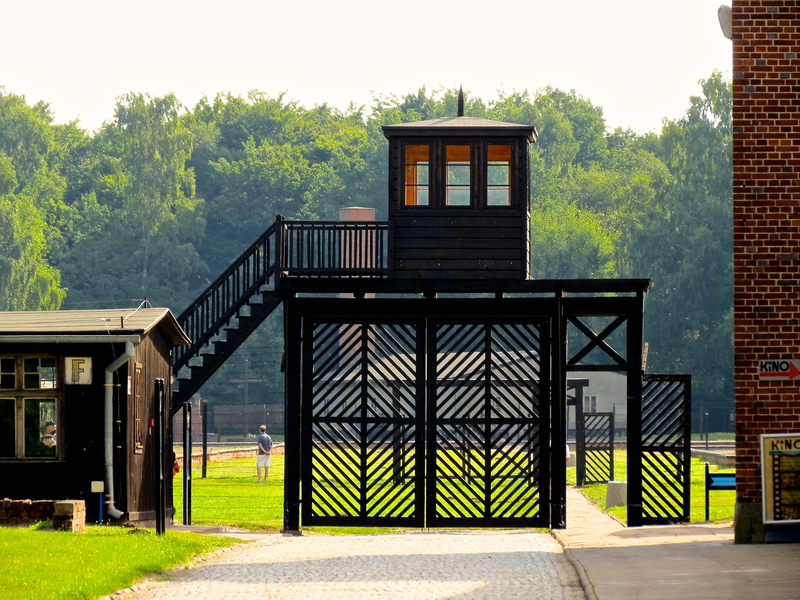 Outside of the Stutthof facility, there were 39 sub-camps scattered throughout Poland. Men, women and children lost their lives here. It is estimated that more than 85,000 people were either shot, hung, gassed or died of malnutrition and disease here. 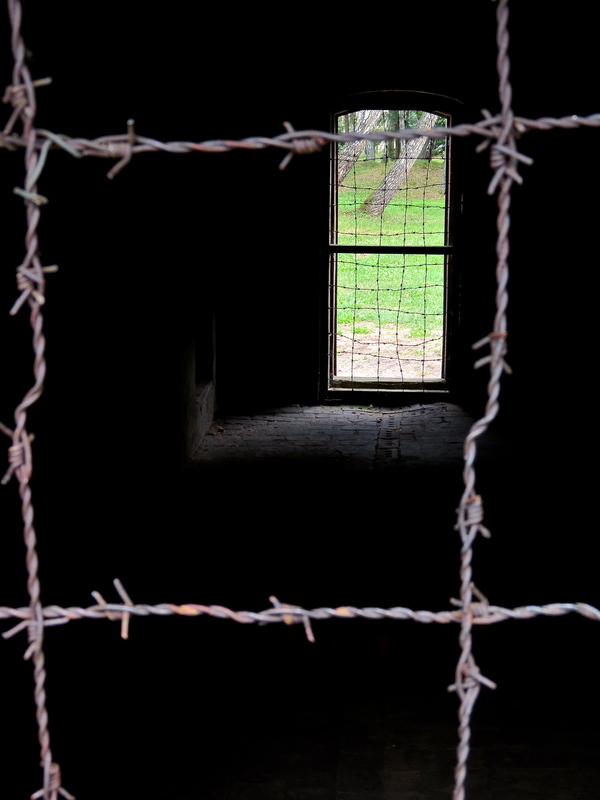 In 1945, of the 50,000 remaining prisoners in the Stutthof camp system, half of them died. 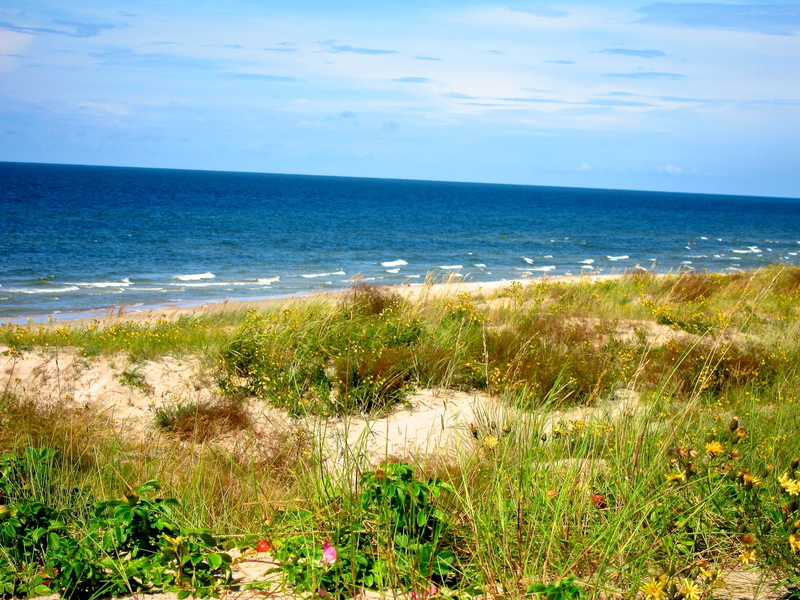 5,000 died on a death march to the Baltic Sea, where they were forced into the water and machine-gunned. Known as the Death Gate, this is the prisoners entrance to the camp. 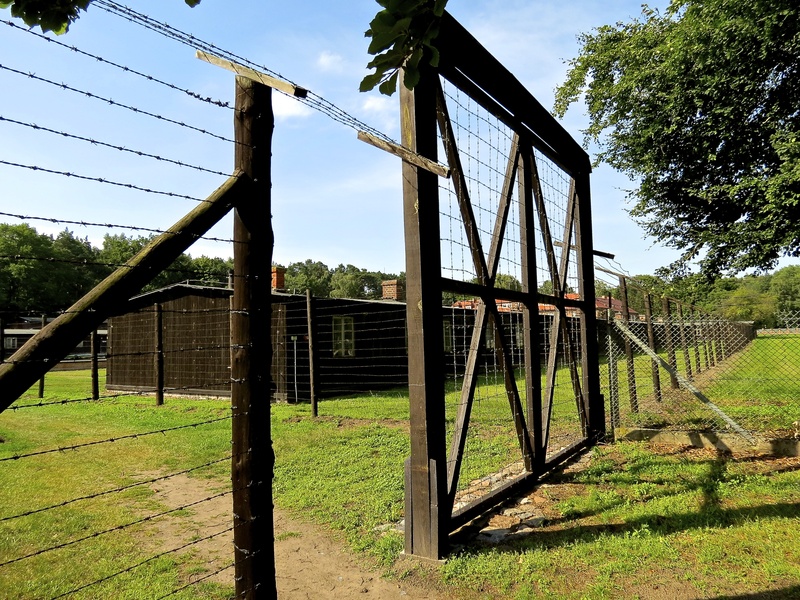 When we arrived at Stutthof, we stood for a long time inside the main gate near the SS headquarters just outside the camp itself which was completely surrounded by barbed wire. Quite frankly, I tuned out most of what our tour guide was saying, lost in my own thoughts. Most of the information she was relaying to us, I had heard before– this was a deeply, personal experience for me. The camp and the museum exhibits are quite sterile. By that, I mean there is nothing displayed in an effort to encourage emotion. Still, I couldn’t help but shudder when I walked through the Death Gate, past the barbed wire and into the camp. 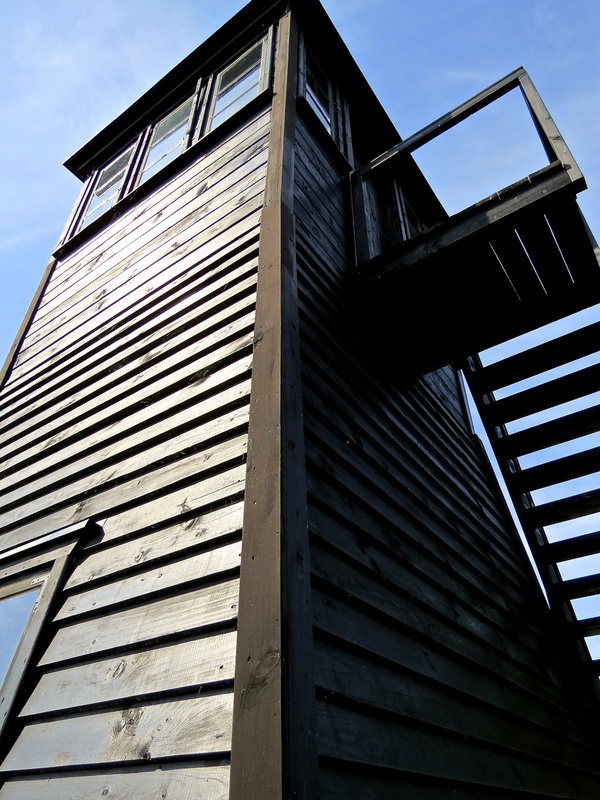 One of the guard towers standing watch over the camp. My head was full of the atrocities that took place here. The horrifying conditions, the torture… they even experimented with making human soap from the victims’ remains. Some of the barracks still stand. 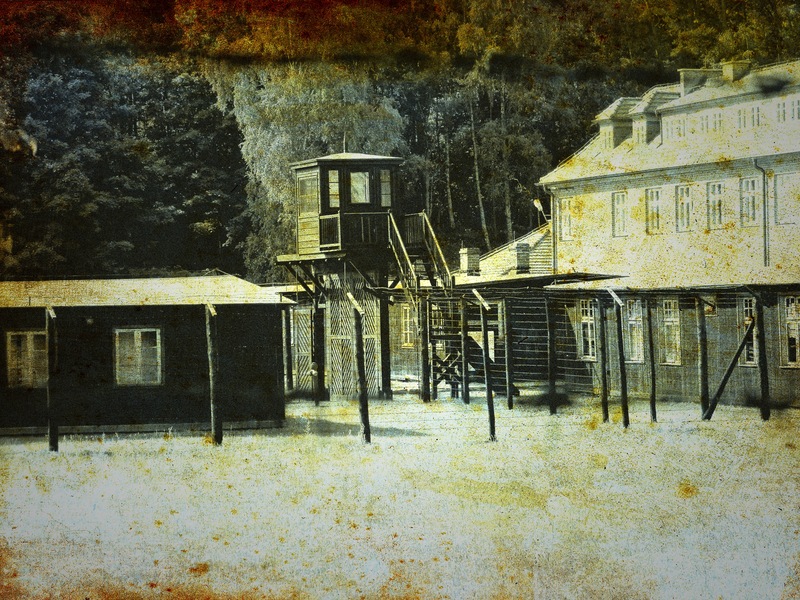 Guard Towers surround the camp, assuring that no prisoners could have escaped. In the center of the large fenced yard are the crumbling foundations of the workhouses. Of course, much of the camp was destroyed as the Allied troops approached, in an effort to eliminate any evidence of what occurred here. 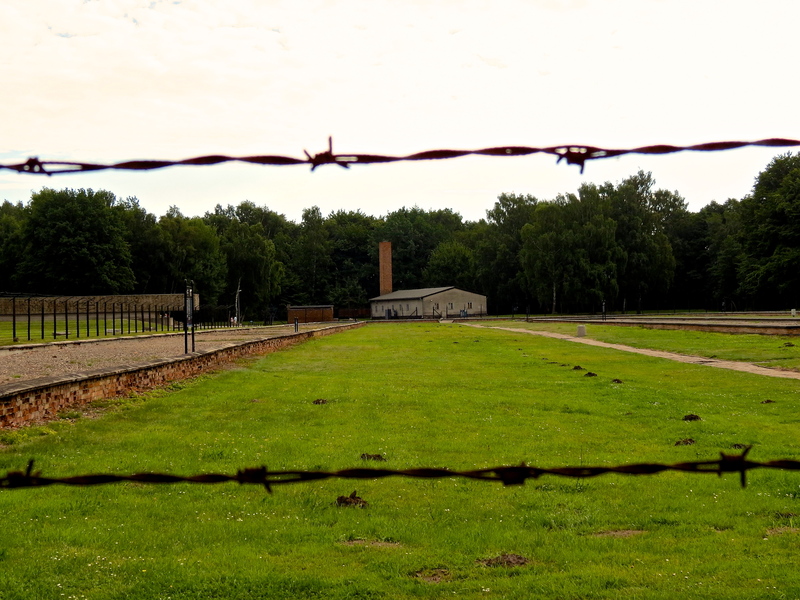 At the far end of the camp stands the gas chamber and crematory. I couldn’t believe how incredibly small the gas chamber was… the interior, possible 12 feet by 20 feet at the most. In the distance stands the gas chamber and crematory. 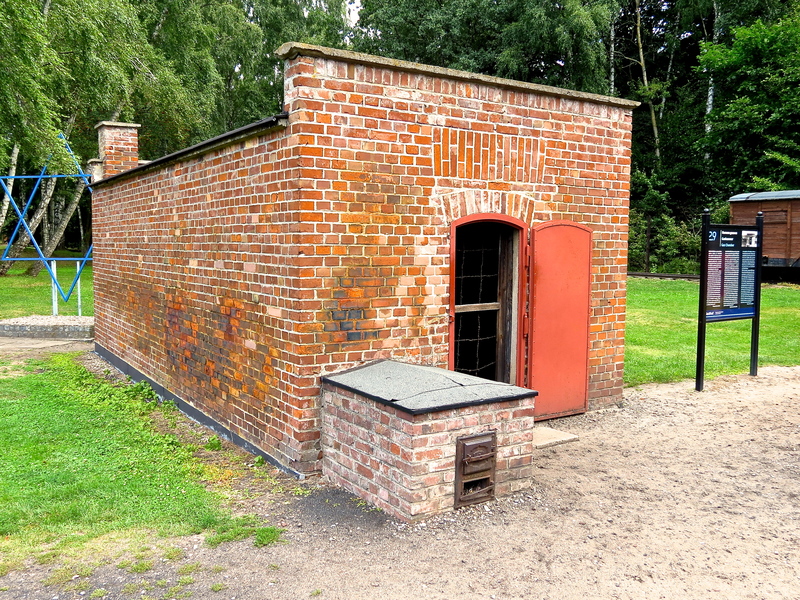 The gas chamber at Stutthof. In the corner, a marker and replicated gallows stand where hangings took place. It stands very near an old wooden gate crossing train tracks that brought in cattle cars full of prisoners. 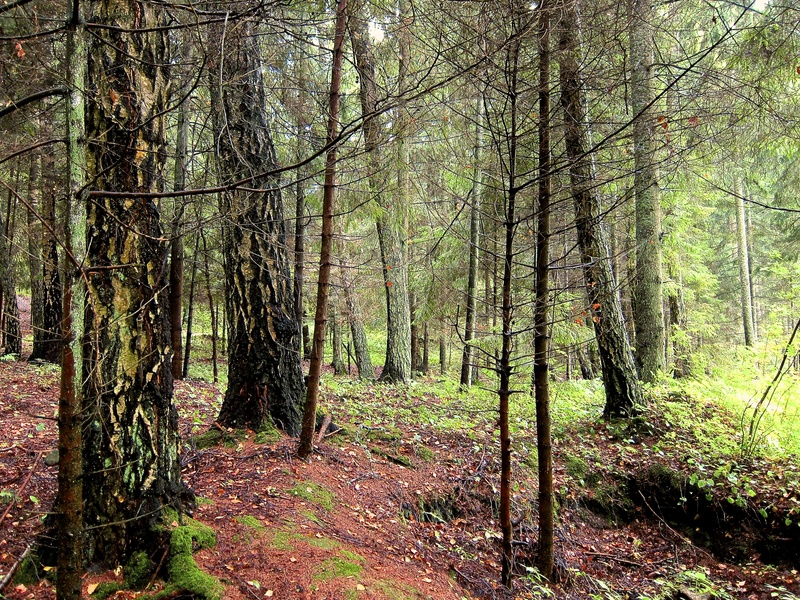 The location of the new camp at Stutthof. Barrack markers for the new camp. Outside the old camp, the location of the new camp barracks is memorialized with large white stone markers. The majority of the camp is a wide open field, scattered with what remains from this defining moment in history. I’ll let the rest of the pictures speak for themselves. 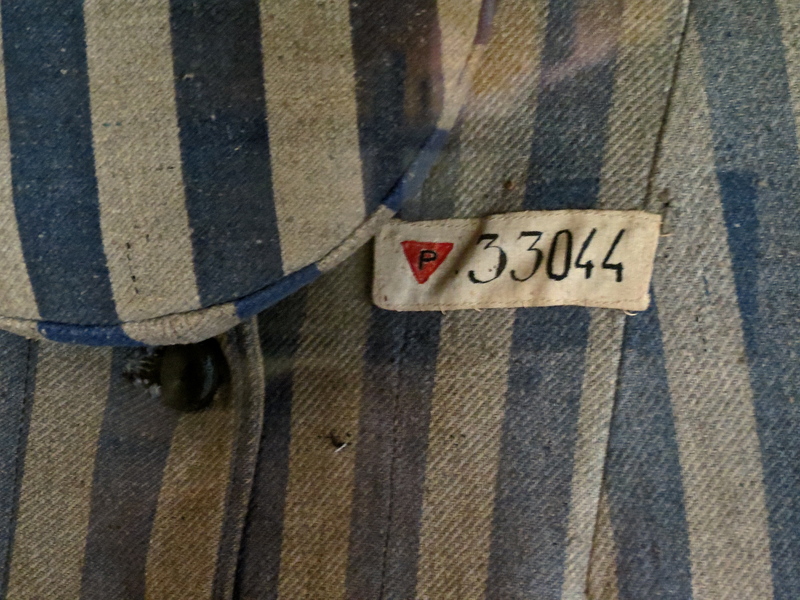 A prisoner’s uniform on display. 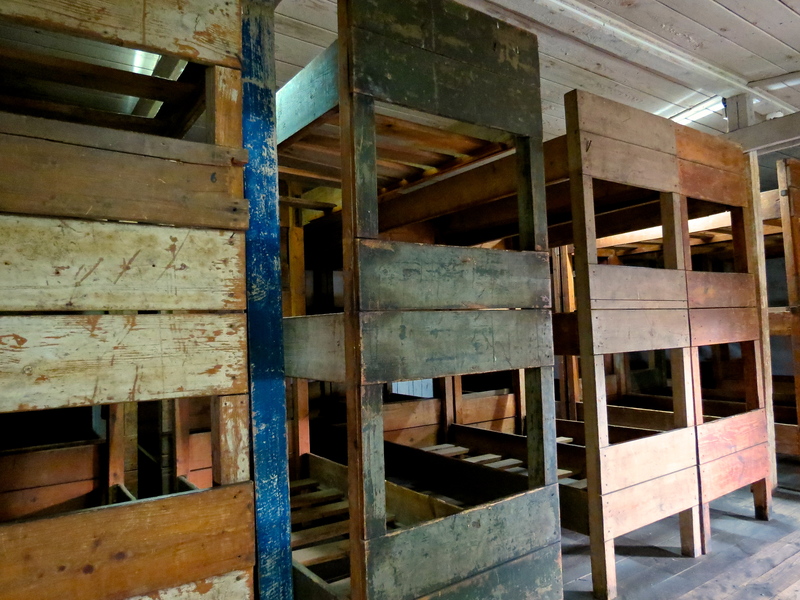 Rows of bunks crammed into the barracks. Many prisoners were forced to sleep on top of each other on the floor. A toilet inside one of the barracks. 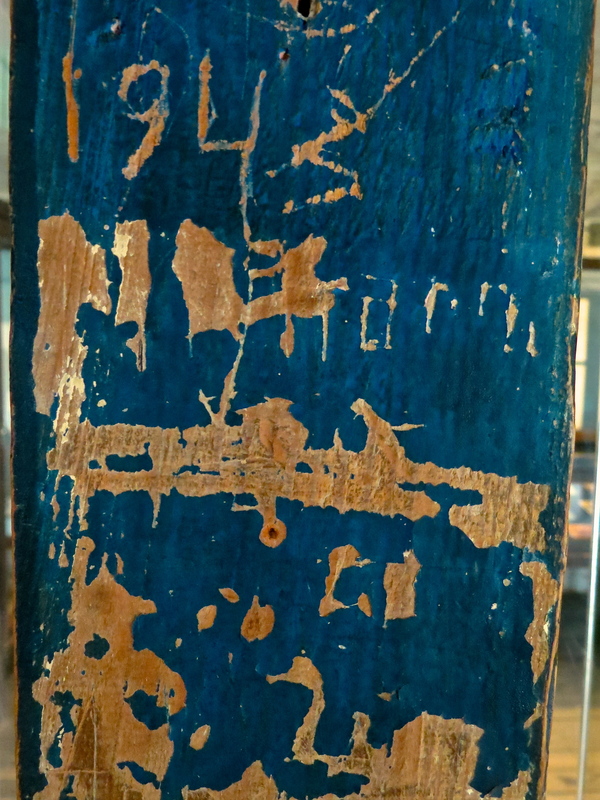 Scratchings by prisoners on one of the posts inside the barracks. The crumbling foundation of one of the workhouses. 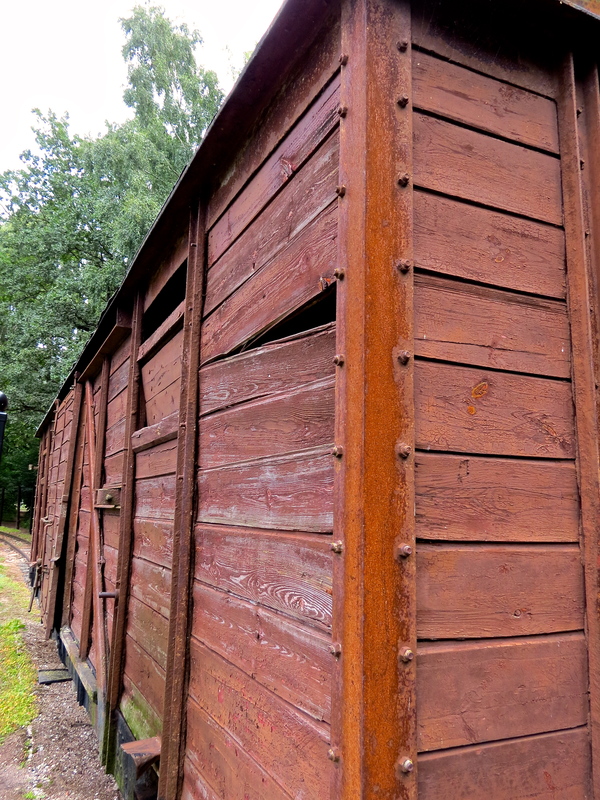 Cattle cars were used to transport prisoners into the camp. Looking inside the gas chamber. Looking up at a guard tower. Outside the old camp, looking in from the new camp. 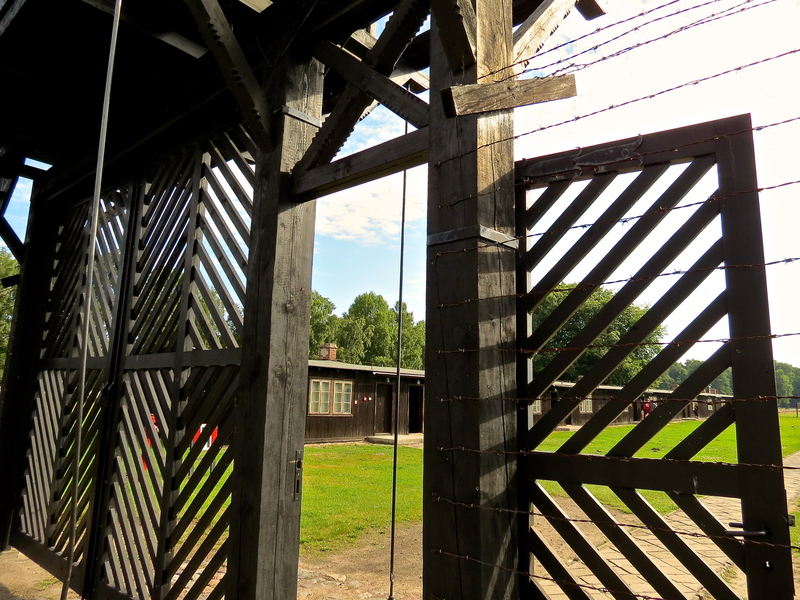 Standing outside the Death Gate at Stutthof Concentration Camp. 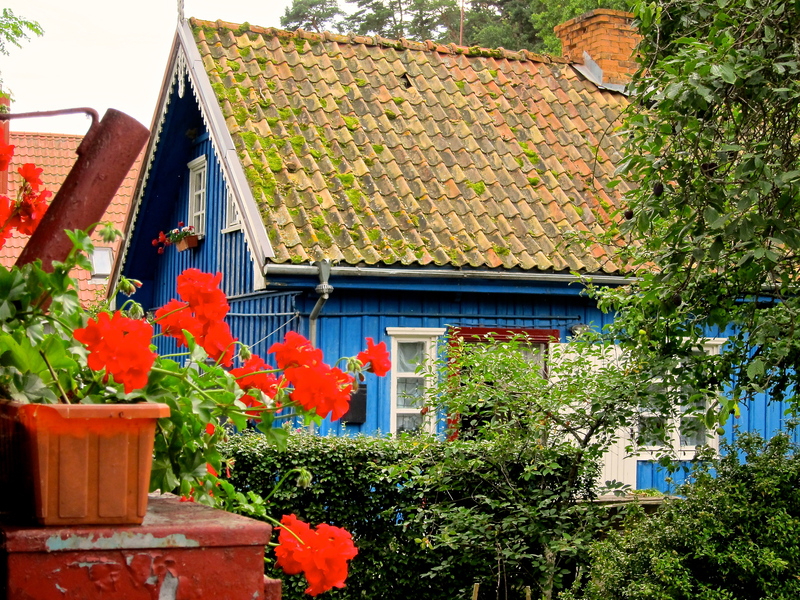 The minute we pulled into port, I envisioned Tallinn as a fairy tale city. From our balcony, you could see the more modern city architecture to the left; and to the right, Old Town, looking as if it was lifted out of the pages of an old story book. 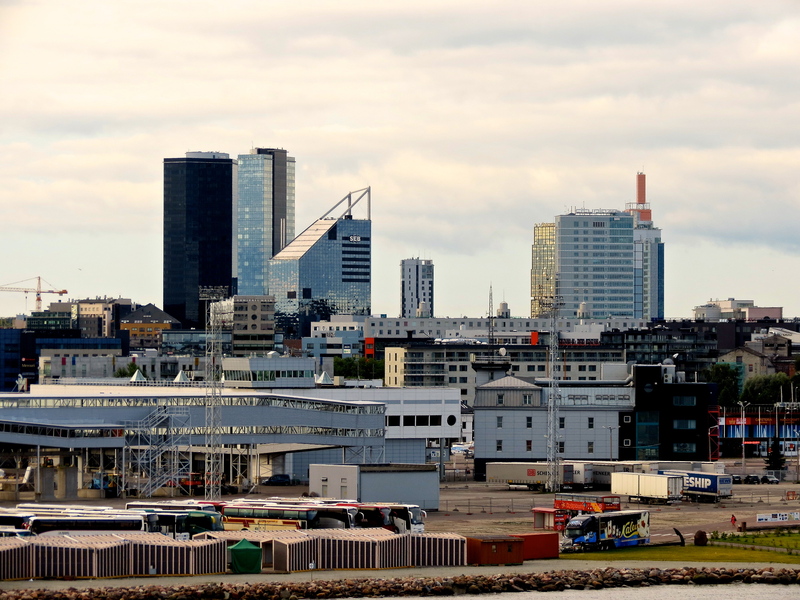 The skyline of modern Tallinn, viewed to the left, from our ship. The skyline of Old Town Tallinn, viewed to the right, from our ship. Tallinn is the capital city of Estonia and an important seaport. The established city has been dated back to 1154 AD with artifacts having been dated back to 3000 BC. Tallin was known as Reval, from the 1200s to 1917, before assuming its current name. It reverted back to Reval during the Nazi occupation and then the name Tallinn was again restored in 1944. 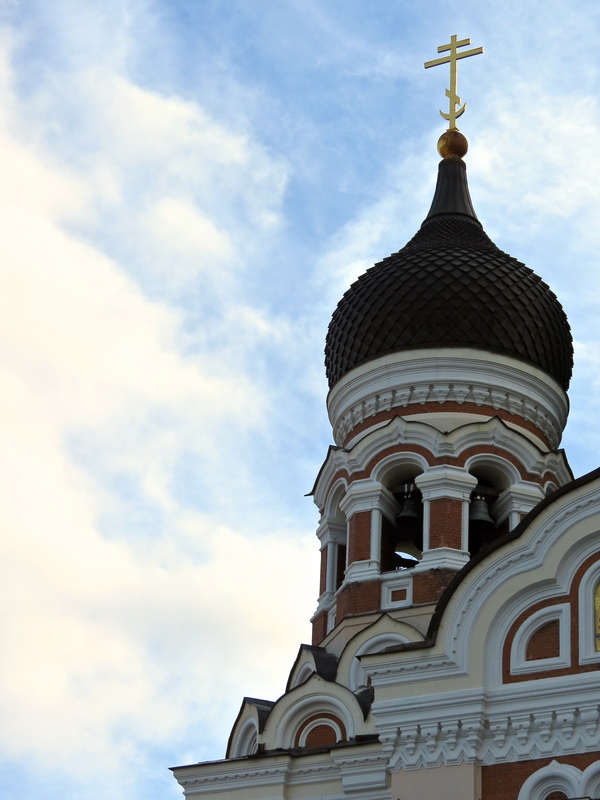 One of the onion domes of the Alexander Nevsky Cathedral against the blue sky in Tallinn. Our tour of the day was “Upper Town and Rocca al Mare and Folk Show“. 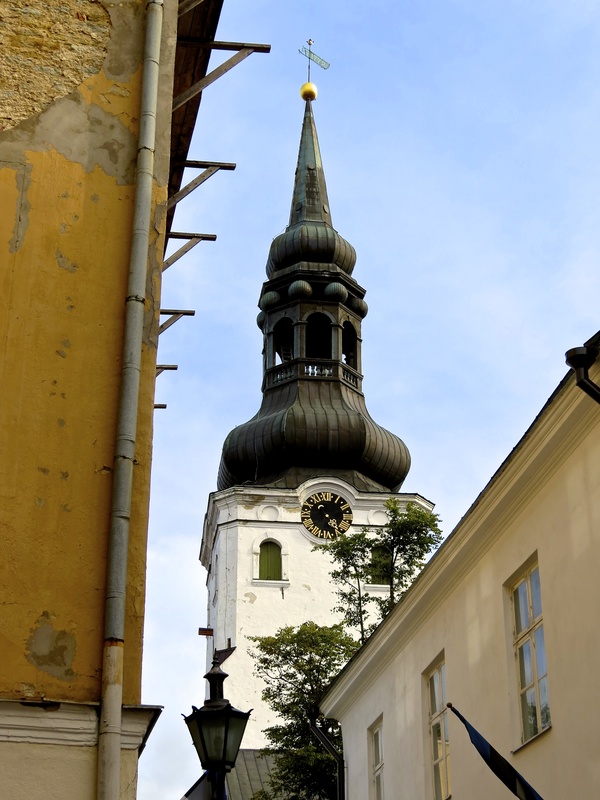 We started in Toompea (Upper Town), touring the Alexander Nevsky Cathedral and then continuing on foot through the quaint streets of Old Town Tallinn. The Alexander Nevsky Cathedral was build at the end of the 1800s while under the Russian Empire, as an orthodox cathedral. The inspiration is immediately recognized by the prominent onion domes. 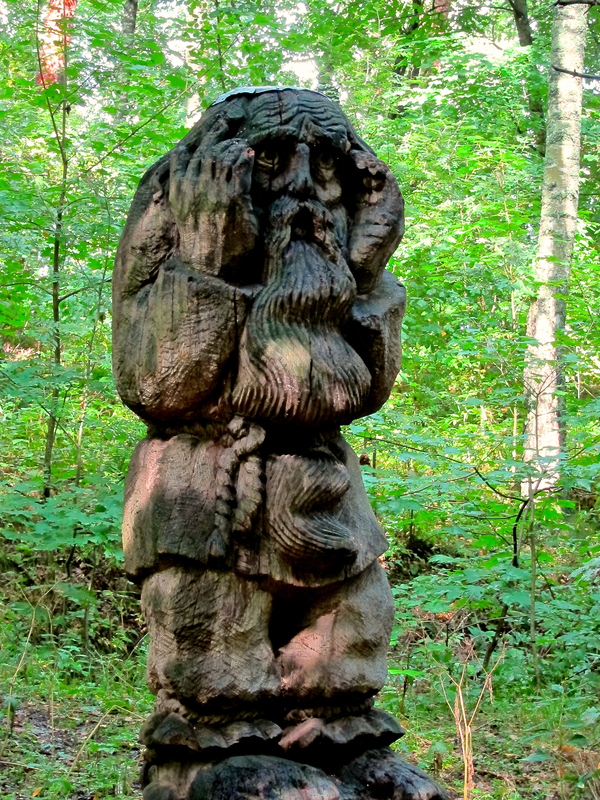 It was almost demolished in the 1920s because the people of Estonia viewed it as a reminder of Soviet oppression. Luckily, it was saved and has been restored. We wandered the narrow cobble stone streets until we reached the medieval Cathedral of Saint Mary the Virgin known as Dome Church. It was established before 1233 AD and has been repeatedly rebuilt (restored) ever since. The Baroque tower was added in the late 1700s. 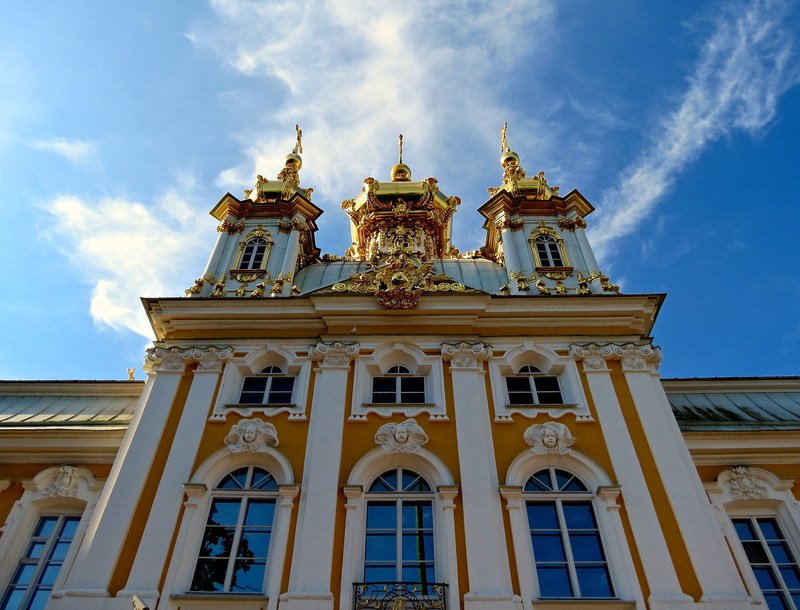 The Baroque tower of the Cathedral of Saint Mary the Virgin, also known as the Dome Church. Michael and I had some time to explore the streets while others on our tour visited some local shops and I really enjoyed just casually strolling through history. 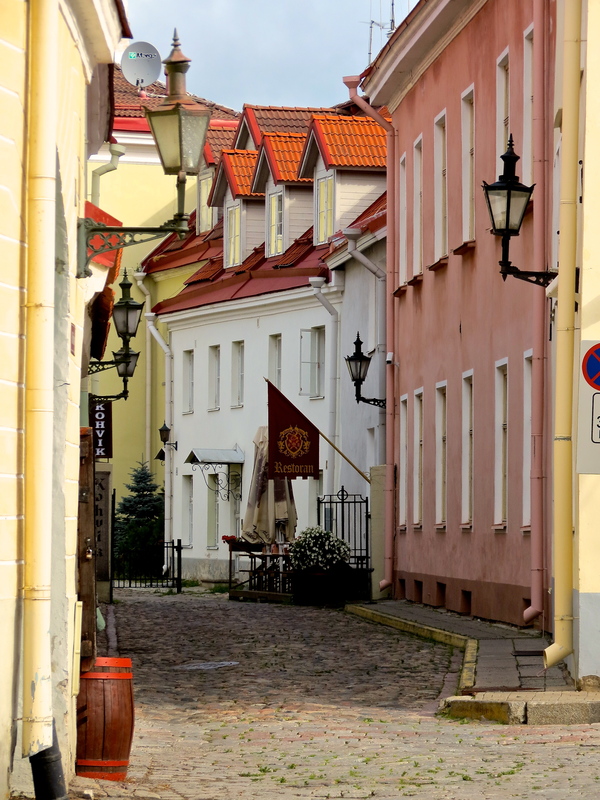 The streets of Toompea (Upper Town), Tallinn, Estonia. 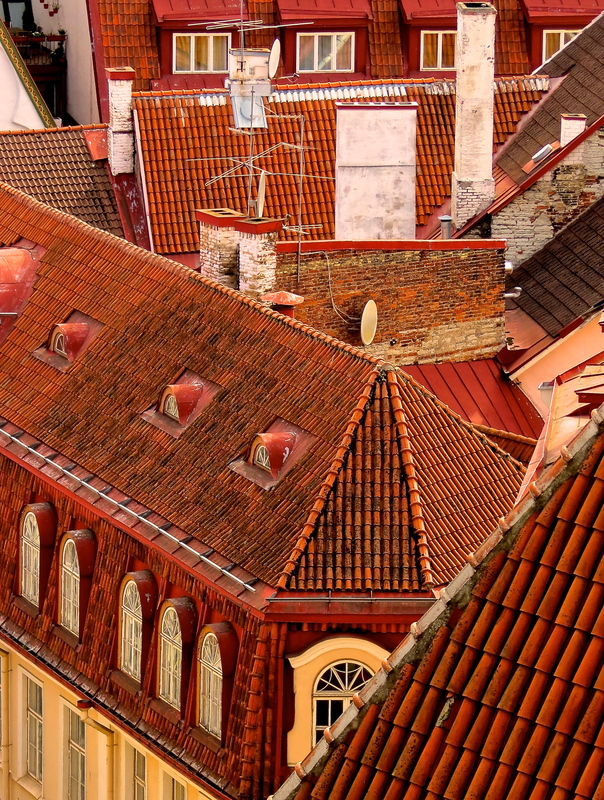 We had a beautiful view of the city and rooftops from Toompea, before making our way back to the bus for the second part of our tour. We didn’t spend time visiting Al-linn (Lower Town) but I would have liked to. I’d definitely consider returning to Tallinn for an extended stay and a chance to fully explore and experience all the history and ambience it has to offer. 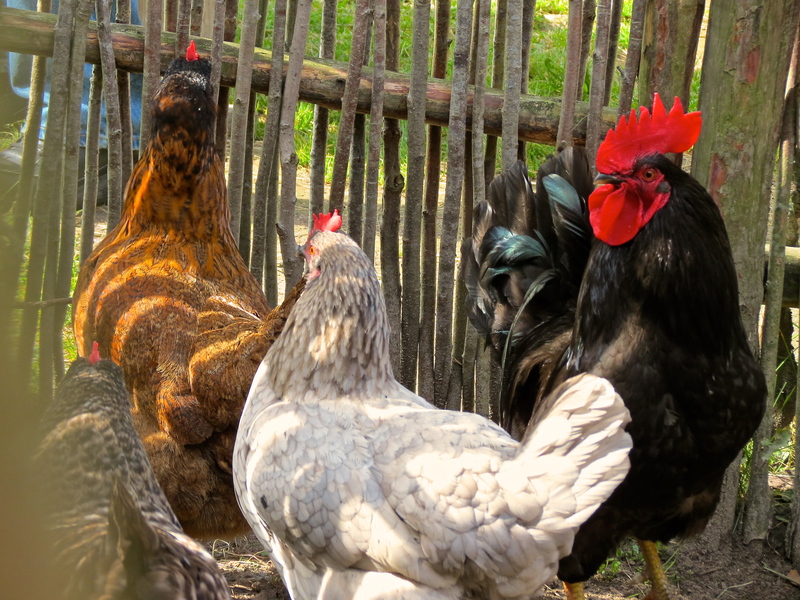 Chickens at the Estonian Open Air Museum. I’m not a huge fan of reenactment parks but I do think they are important historically. The park is beautiful and very well maintained. I found myself most interested in the low moss covered walls and animals (chickens and pigs) than the thatched roof dwellings themselves. 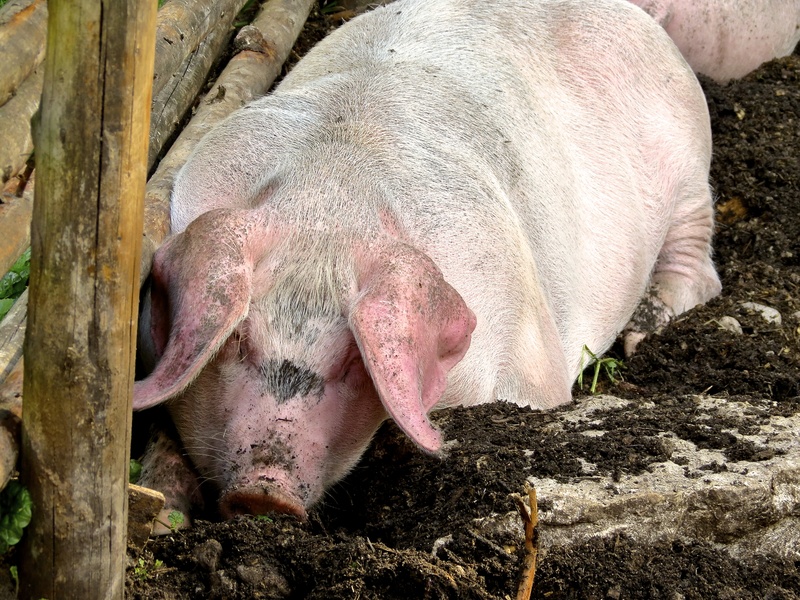 I got left behind at point, talking to a pig and trying to get him to raise his head while I was taking pictures. 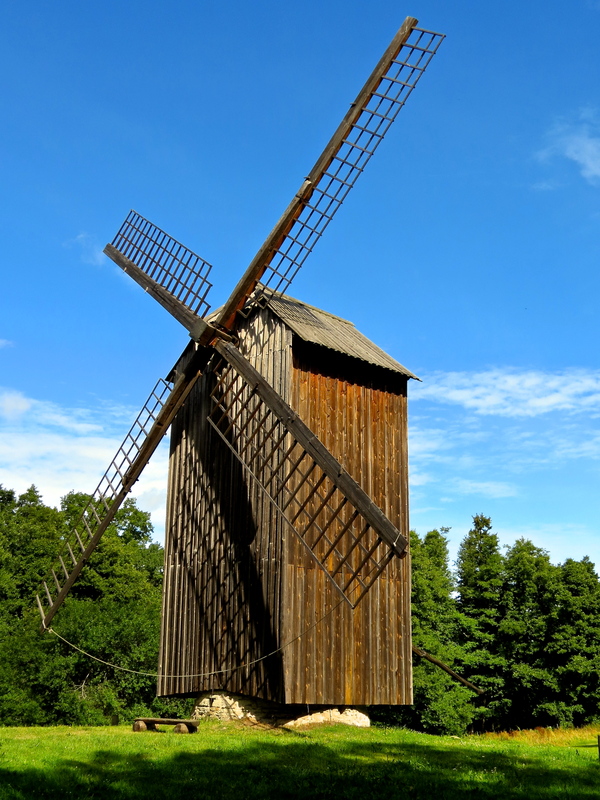 A windmill at the Estonian Open Air Museum. Costumed children running down a path in Rocca al Mare. 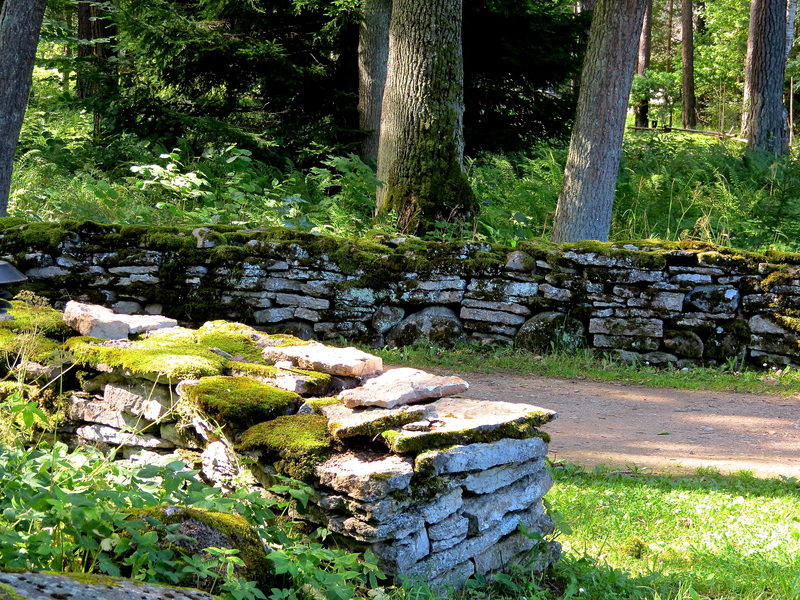 Beautiful moss-covered walls lining the paths at the Estonian Open Air Museum. 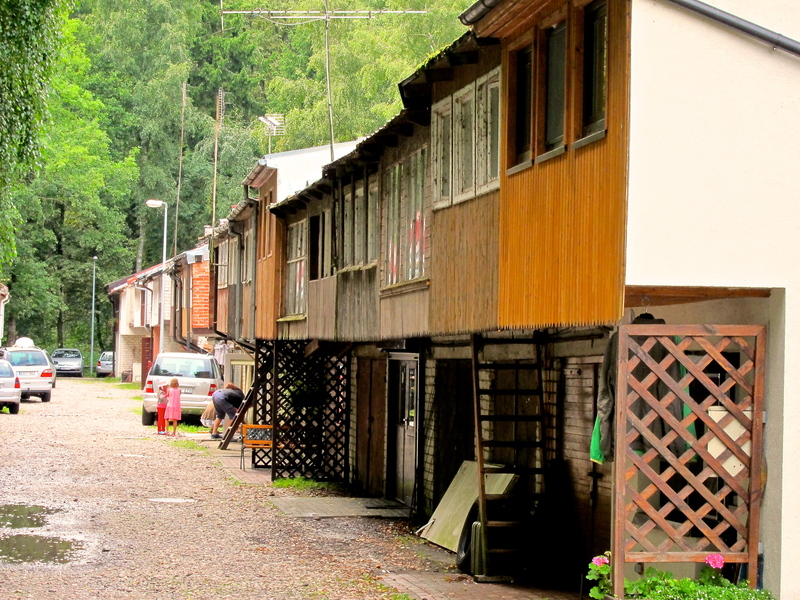 I loved that we were able to combine the old city with some of the more natural surroundings of Tallinn. It was sunny and warm– a beautiful way to end the day. 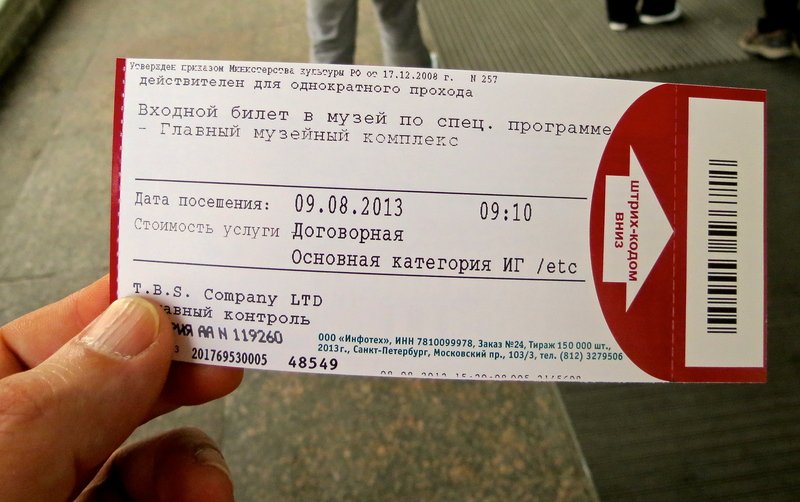 My admission ticket to the Hermitage. 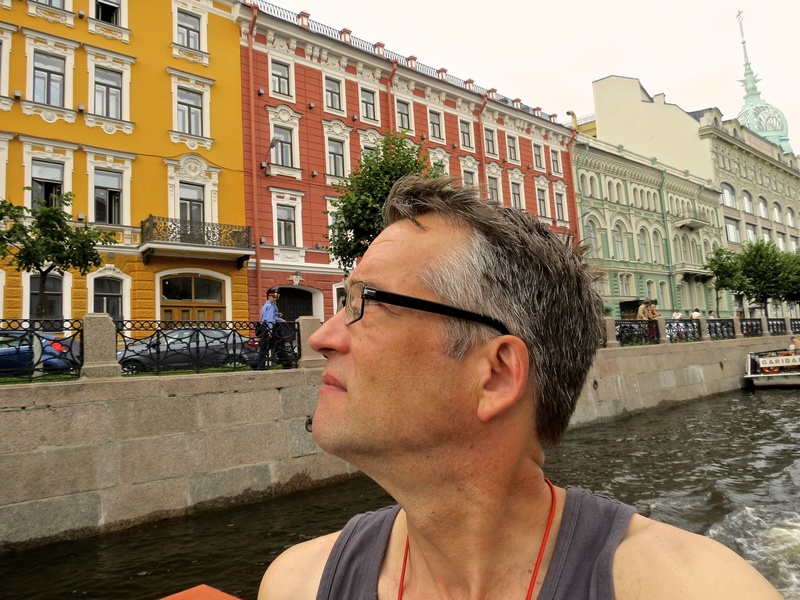 Last day in Saint Petersburg, Russia and we’d be spending it on two more excursions, “The Hermitage: A Wealth of Art and History” and “Canal Cruise and Shopping“. What a beautiful city! 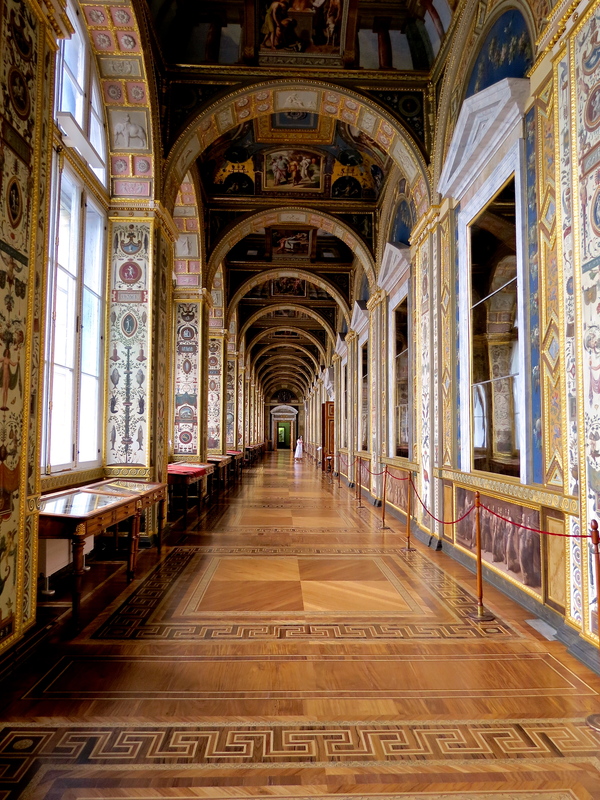 The Hermitage or State Hermitage, is one of the largest and oldest museum collections in the world. The complex that houses it is made up of six buildings including the Winter Palace, the former main living quarters of the Russian tsars. 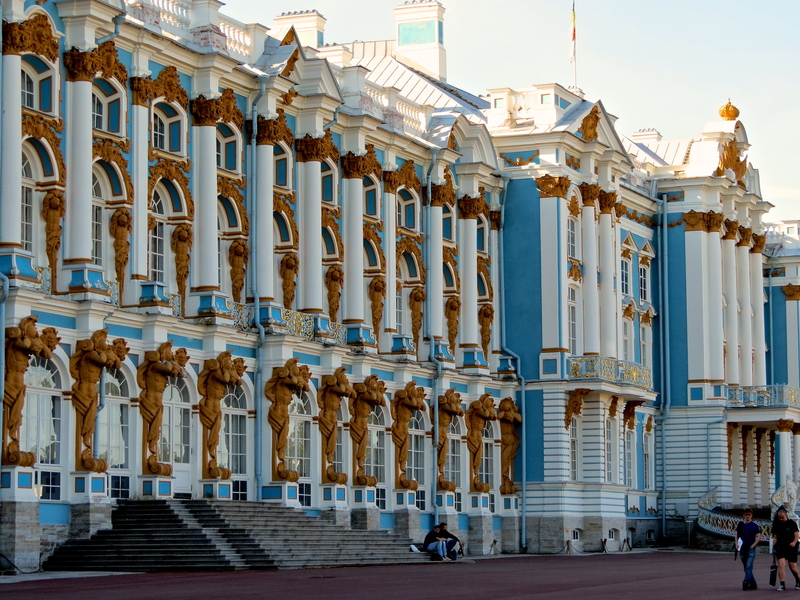 Catherine the Great started the collection in the late 1700s but it wasn’t open to public until the mid-1800s. My numbers could be wrong but I believe our guide told us we only saw about 1% of the collection and that only about 15% of the collection is ever on display at any one time. 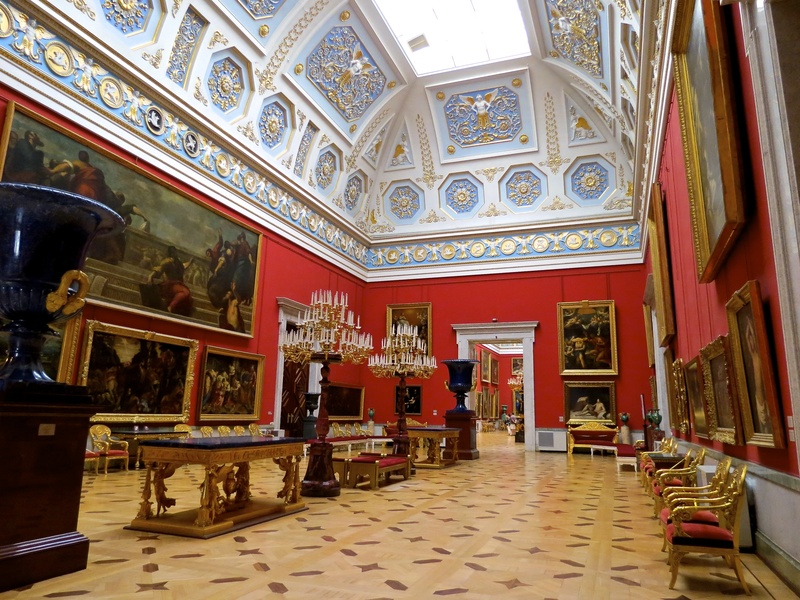 In all, there are more than three million pieces in the Hermitage collection! We viewed works by Michelangelo, Da Vinci, Monet and Picasso to name a few. I recognized several pieces I’d seen in books or as reproductions over the years and found myself drawn to the larger murals and sculptures the most. A sculpture wing in the hermitage. 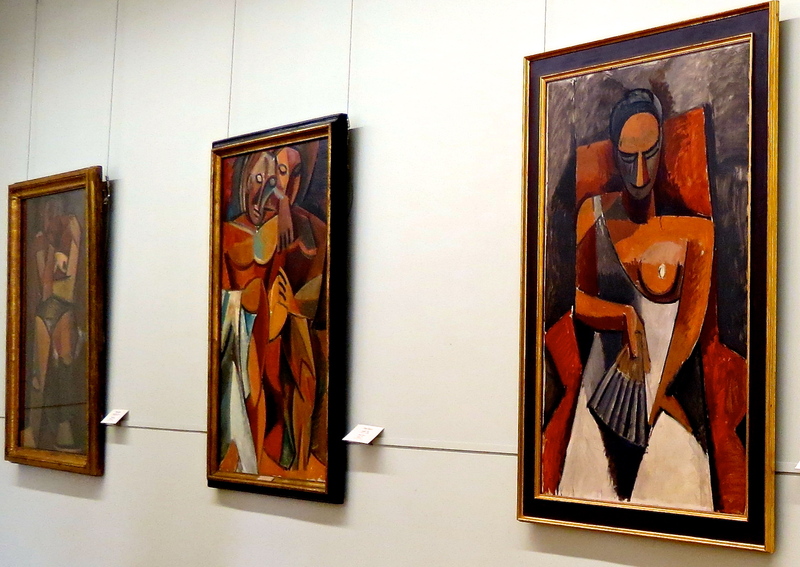 I think overall, I was as intrigued and impressed by the Hermitage architecture and the layout of the gallery displays as I was the actual art collection itself. We viewed room after room of gorgeous, grand halls beautifully restored and elegantly decorated with art by the Masters. Too much to see in a short period of time. At one point on the tour, we were passed by workers pushing two carts of painting through the halls. 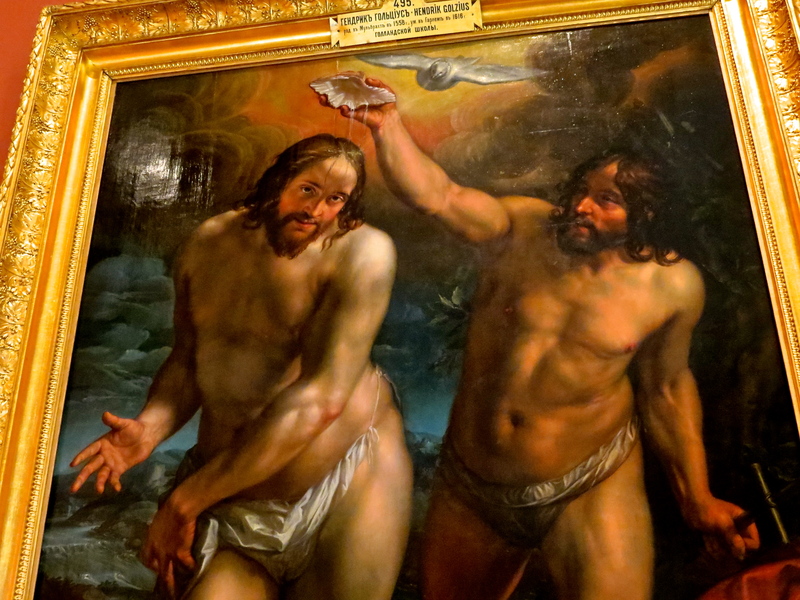 The paintings were unprotected, bouncing and rubbing against each other and I was a little shocked that greater care wasn’t being taken with the priceless art. 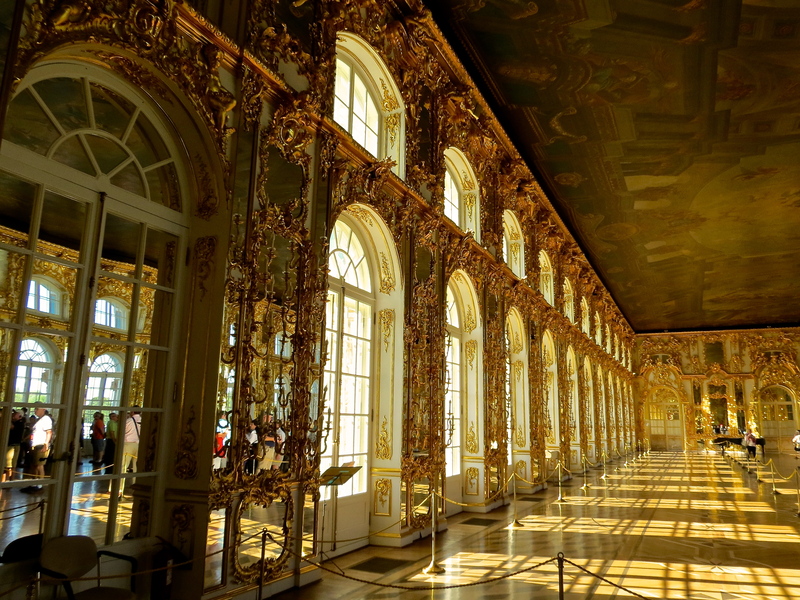 Priceless beauty of the Hermitage. Once the museum opened to the public for the day, we could barely move. The line outside to get in was ridiculously long as well. 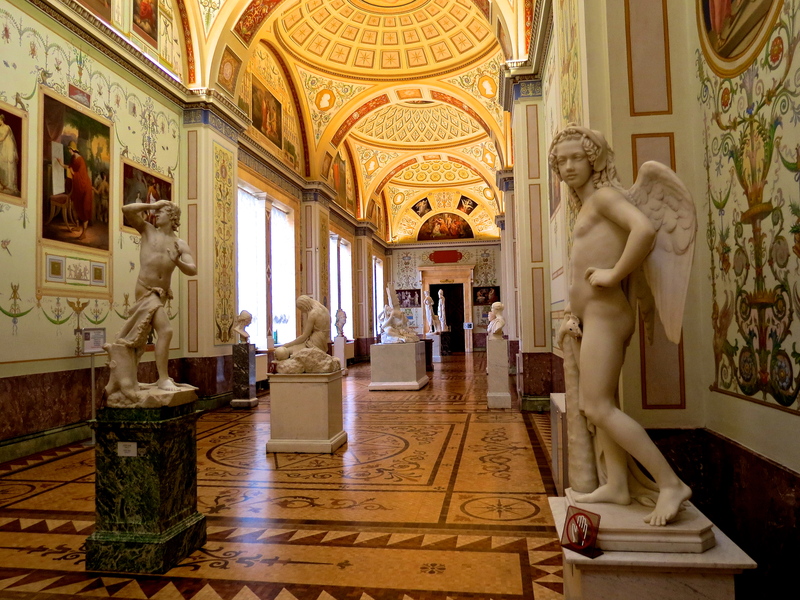 My favorite gallery space in the Hermitage. I love the almost ghostly, figure towards the end of the hallway. That afternoon, we met for our canal cruise and shopping. It was a little overcast so we took umbrellas, just in case. Our guide took us shopping first. Our bus pulled up to the equivalent of a strip mall and our guide, Alexey, told us what store we were going to shop. Now I realize that many people have different interpretations of shopping but let’s be real here. Michael and I assumed we’d be going to an open air market or shopping district that would have, among other things, souvenirs. Others on our tour thought we’d be going to a street with designer shops. We were all wrong. The shop we entered was basically a small overpriced souvenir warehouse that was laid out like a small American dollar store. I was only interested in purchasing matryoshka (nesting dolls) and maybe a t shirt. Well, they had one small rack of ugly, cheap looking t shirts (for around $30 USD a piece) but they had lots of nesting dolls. Only they were marked up about 400% to 1000% in price. So shopping was a joke. We were there quite a while, most of the women on our bus bought something, while most of the men stood outside the bus shaking their heads. For a moment, I thought I was back in America. Along the canal in Saint Petersburg. The weather cooperated as we boarded our small boat for the canal cruise. Just in case, the boat had an open, upper deck and an enclosed lower deck if it rained. Michael and I sat in the back of the upper deck and I was on a raised storage box that doubled as a seat, so I could take pictures. I literally had to duck every time we went under one of the many bridges we passed under. There was a nice breeze and it was a relaxing ride. I loved seeing the city from this different perspective. Russian workers taking a break along the canal. I have to say something about our guide, Alexey. He was a young, tall, skinny guy, probably in his 20s and he spoke with this sort of Russian-French dialect. Michael refers to him as Pepe le Pew. Alexey spoke with a very breathy voice and ended each phase with a breathy chuckle or laugh. This was our second tour with him, so we knew what to expect. It was funny to watch all the first-timers’ heads turn, open jawed and bewildered as he started this second tour. He certainly entertained us. Michael and I still find ourselves imitating him, randomly, to make each other laugh. 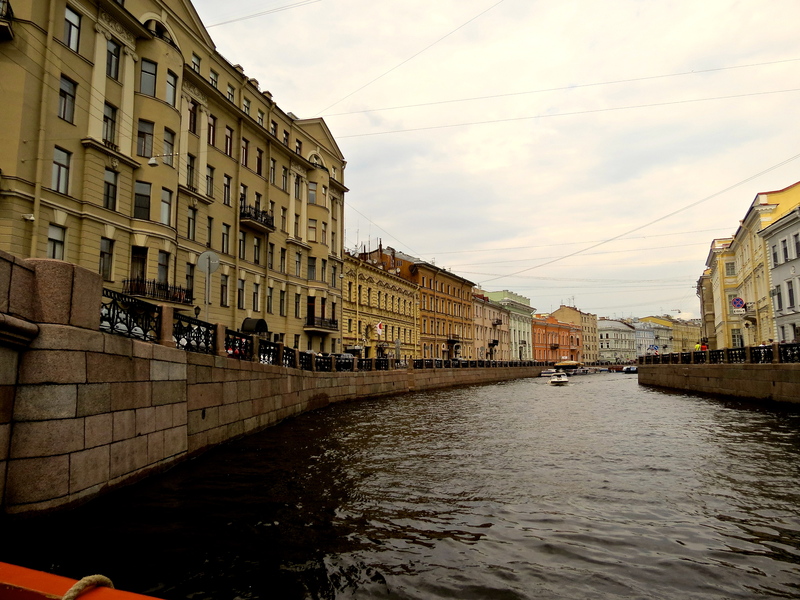 On the canal in Saint Petersburg, Russia. Taking in our last glimpse of Saint Petersburg. 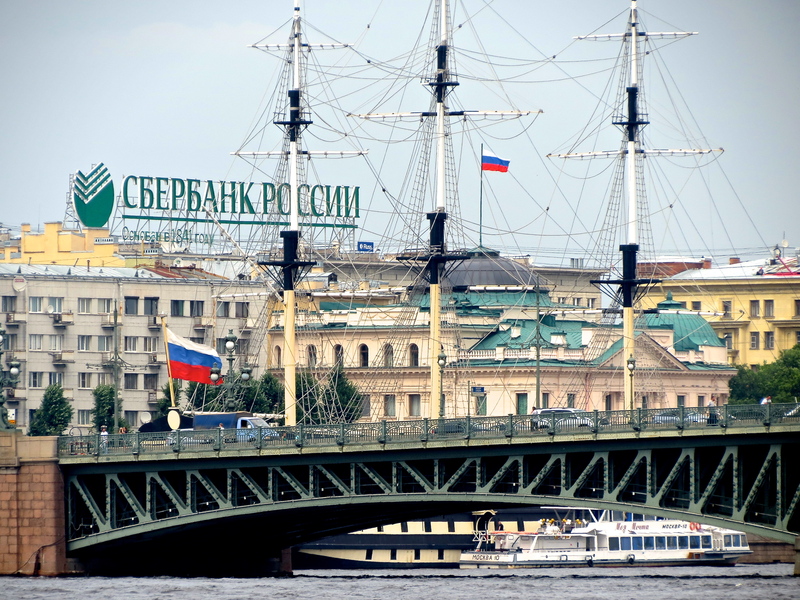 After the canal cruise, it was back on the bus, crossing through passport control one last time, saying proshchaniye (farewell) to Saint Petersburg. Another big day, we’d scheduled two excursions, “Peter the Great’s Grand Palace- Peterhof” and “Saint Petersburg Cathedrals“. By this point on our trip, we’d realized we were only averaging about four hours sleep a night and were happily exhausted. I have to say, I became quite good at taking cat naps on the buses to and from our destinations. 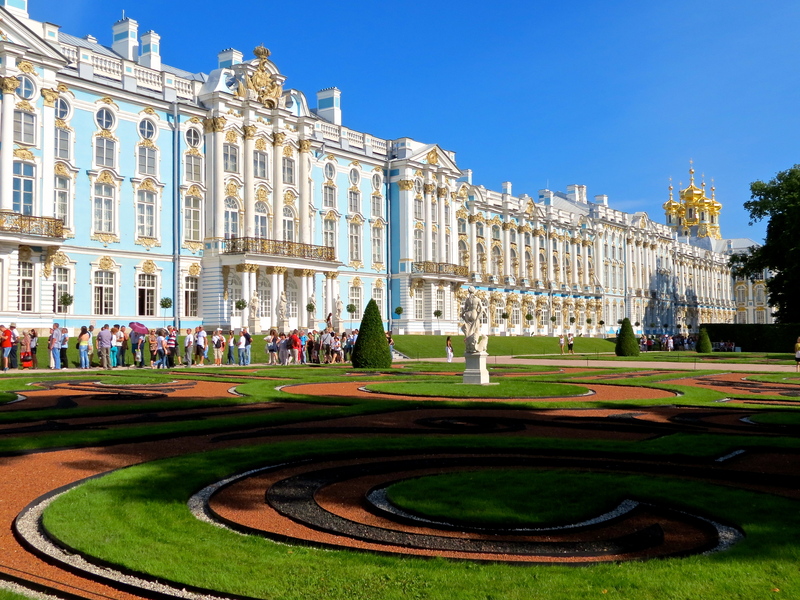 In the morning, we headed to Peterhof Palace for what was to be one of the highlights of our trip. 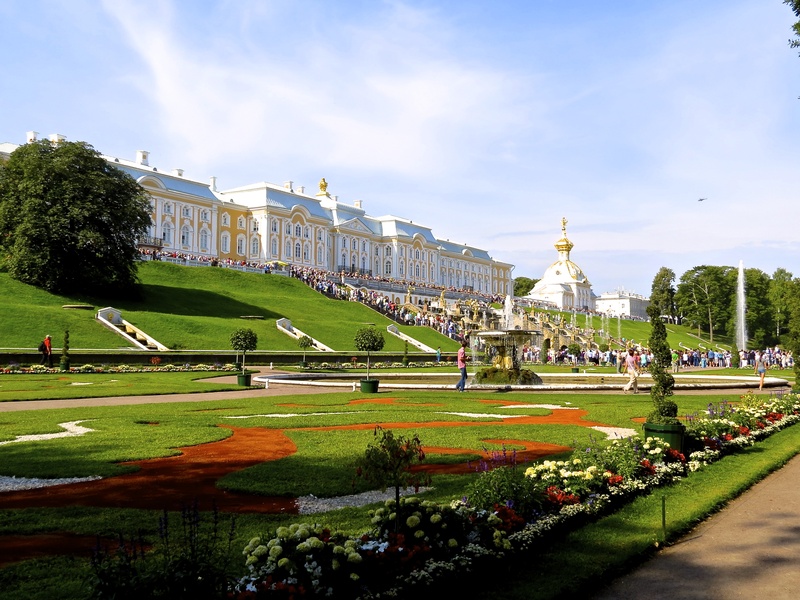 Peterhof is a not-to-be-missed destination. If you are visiting Saint Petersburg, Russia and are short on time, I’d definitely choose Peterhof over Catherine Palace. 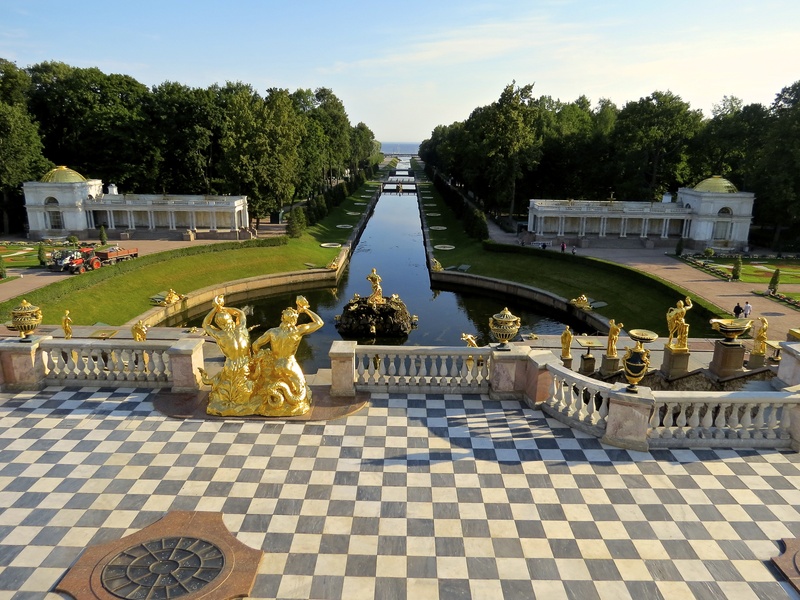 Both are beautiful and opulent but in addition to the Grand Palace, Peterhof has the exquisite Grand Cascade and gardens that are a sight to behold. The Grand Cascade from the palace, before the fountains were turned on. 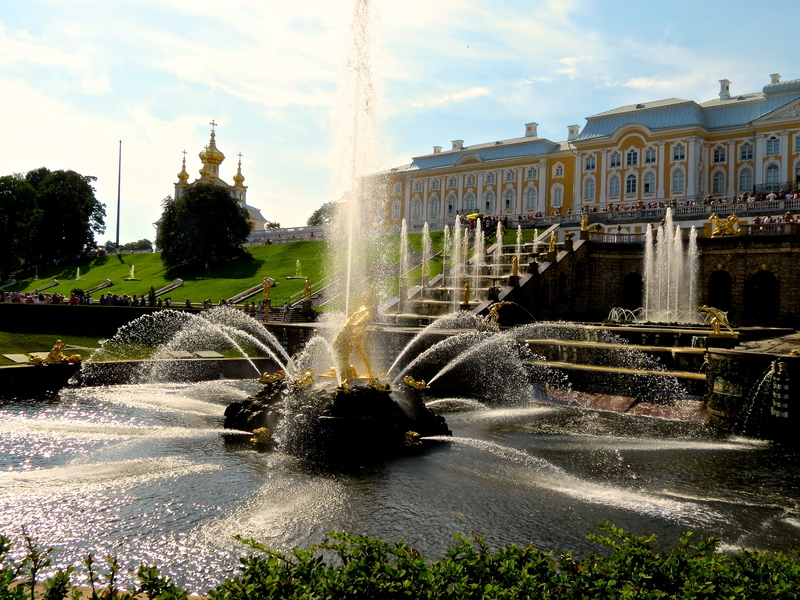 We arrived early at Peterhof, which was important for two reasons: 1) We were one of the first groups to tour the Grand Palace before it opened to the public, and; 2) We were present when the fountains were turned on, on the Grand Cascade. Like Catherine Palace, Peterhof was built in the early 1700’s and sustained substantial damage from the German invasion during World War II. It has been fully restored, though renovations are ongoing. 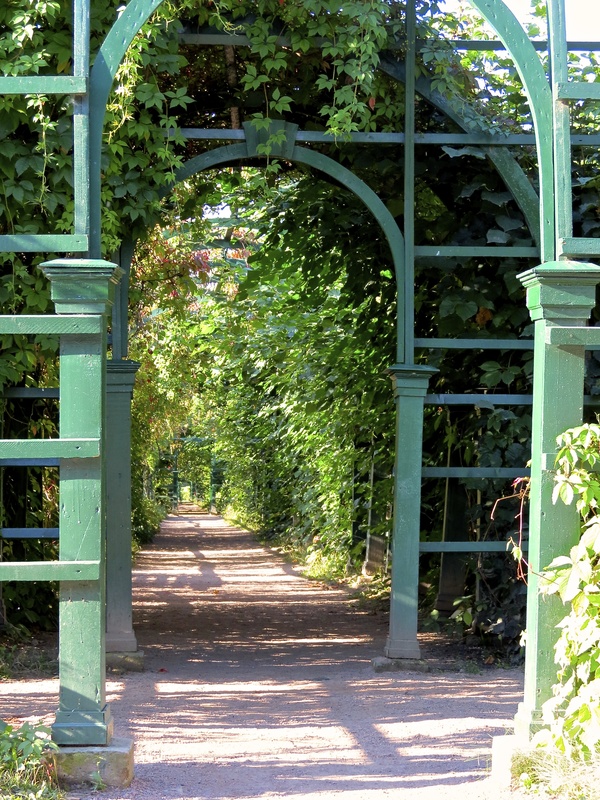 Exploring the gardens at Peterhof. The interiors and gardens were both heavily influenced by French style. There is an overabundance of silk wall coverings, ornamental plaster designs and gold leaf detail in every room. Unfortunately, photography was not allowed inside the Grand Palace. It took about an hour to walk through the palace and then we had about an hour to explore the gardens before meeting back at the Grand Cascade to see the main fountains activated. It was a sunny day and about 70 degrees. Perfect for a beautiful, relaxing walk. 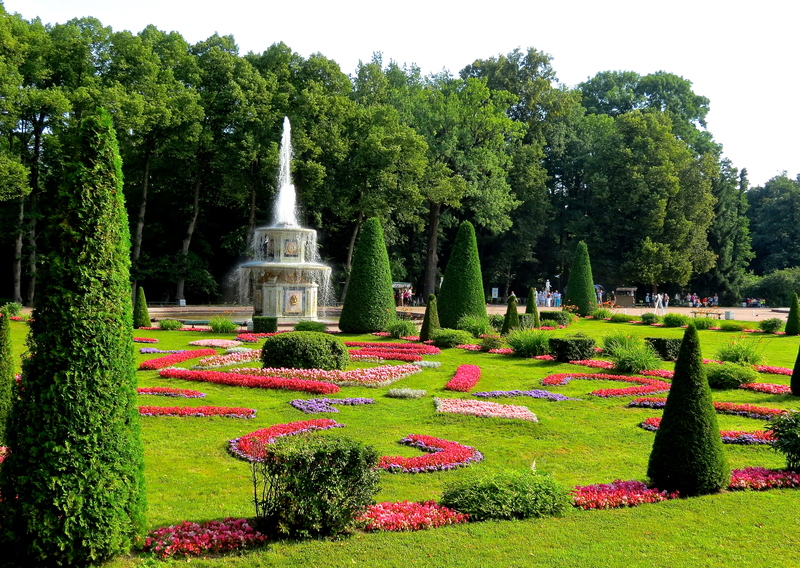 The formal, french-style gardens at Peterhof. Back at the Grand Cascade, we chose to watch the fountains from a lower corner where there were less tourists crowding the area. Aside from the beauty, the big attraction to the fountains is that they are all gravity-fed. No pumps are used to power the many fountains. It’s not only an amazing feat of ingenuity, it’s visually stunning. Peterhof Grand Palace and Grand Cascade as the fountains are being activated. The fountains of the Grand Cascade. 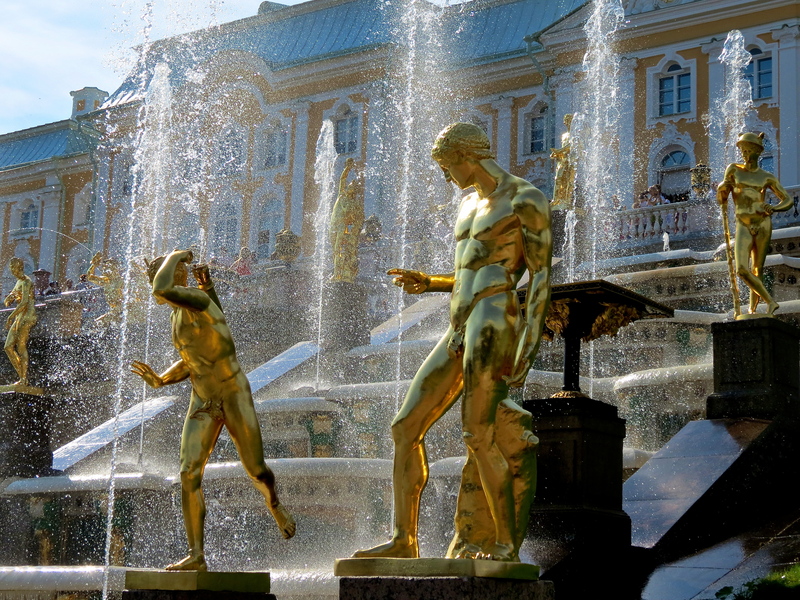 The statues on the Grand Cascade at Peterhof. 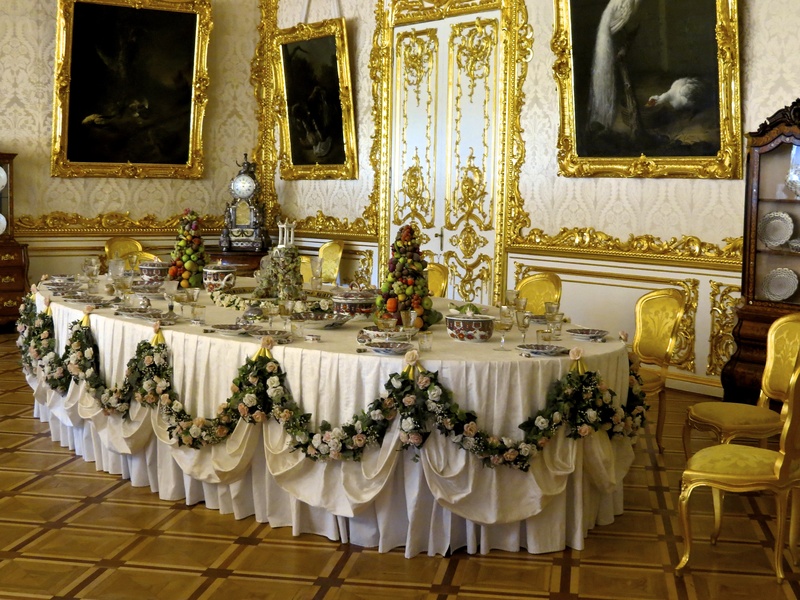 As if the sights of Peterhof weren’t enough stimulation for one day, we had enough time to return to the ship for a quick lunch before meeting our group for a tour of some of the world’s most beautiful cathedrals. 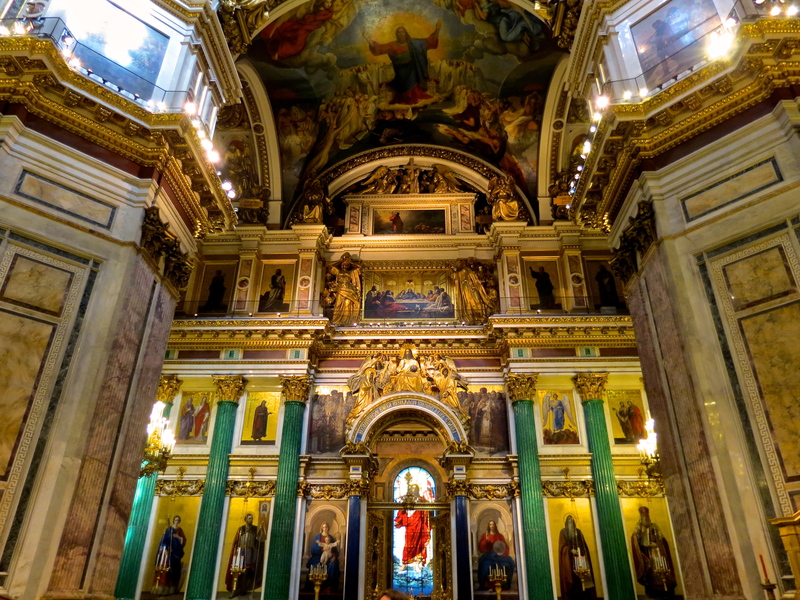 I’m just going to focus on two: Saint Issac’s Cathedral and Church of the Spilled Blood. Saint Issac’s Cathedral, currently under renovation. 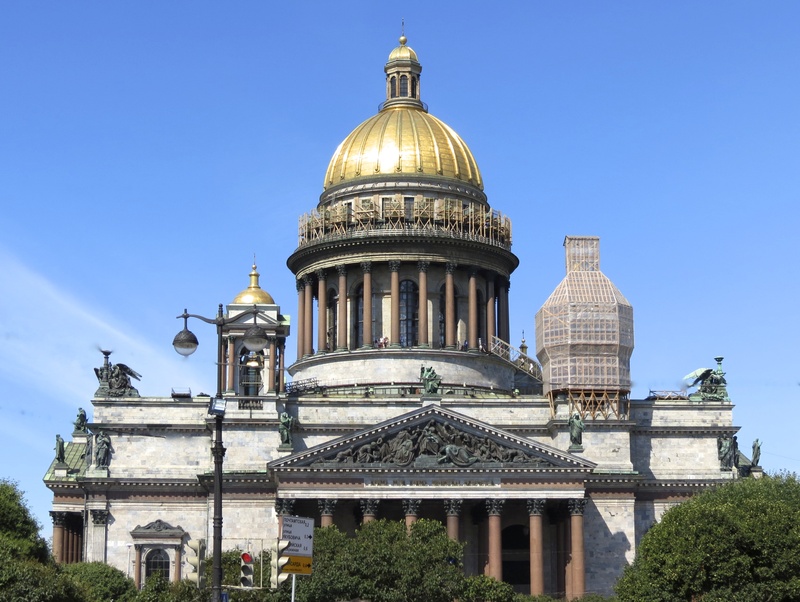 Saint Issac’s Cathedral is the largest Russian Orthodox cathedral in Saint Petersburg. It took 40 years to construct, opening in 1858. I found it interesting to know that the Gold dome was painted over in gray during World War II to deter detection. There are still pock marks from enemy fire, visible on the the large exterior columns. The interior is amazing. The color and detail are glorious. The ceilings of Saint Issac’s Cathedral. Facing the altar in Saint Issac’s Cathedral. 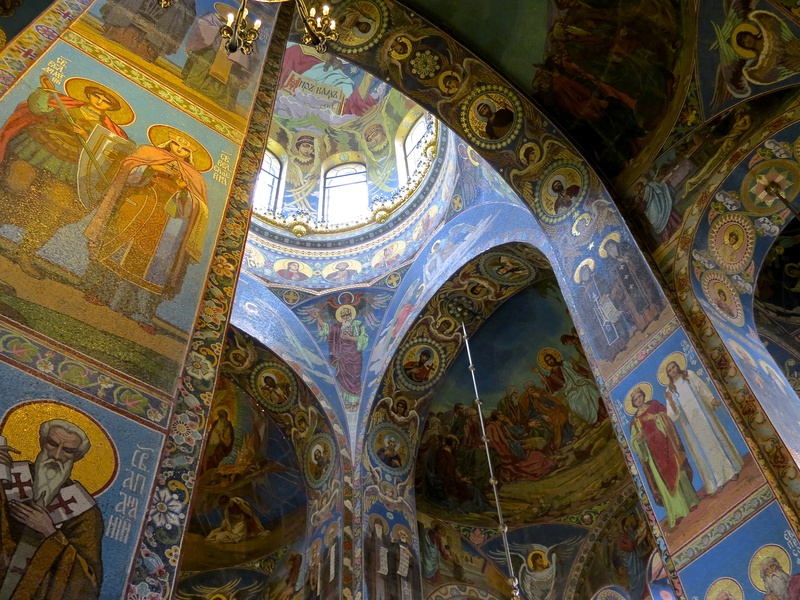 Most commonly referred to as Church of the Spilled Blood, the Cathedral of the Resurrection of Christ is also known as The Church of the Savior on Spilled Blood. 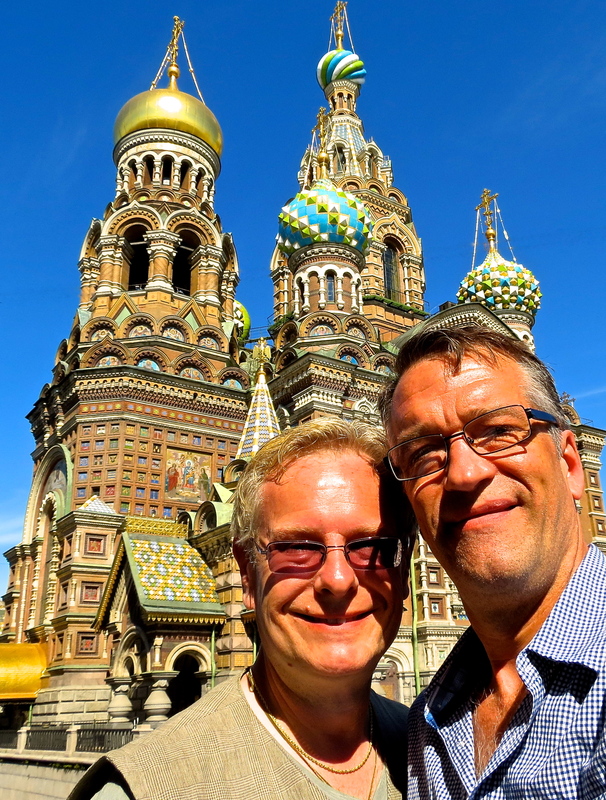 Michael and I at the Church of the Spilled Blood. This was one of my two must-have picture spots of Michael and I on our vacation. (The other was the Berlin Wall.) When we visited and toured the interior, it was turning overcast, so I was grateful we had stopped here briefly the day before and I was able to take some exterior pictures. 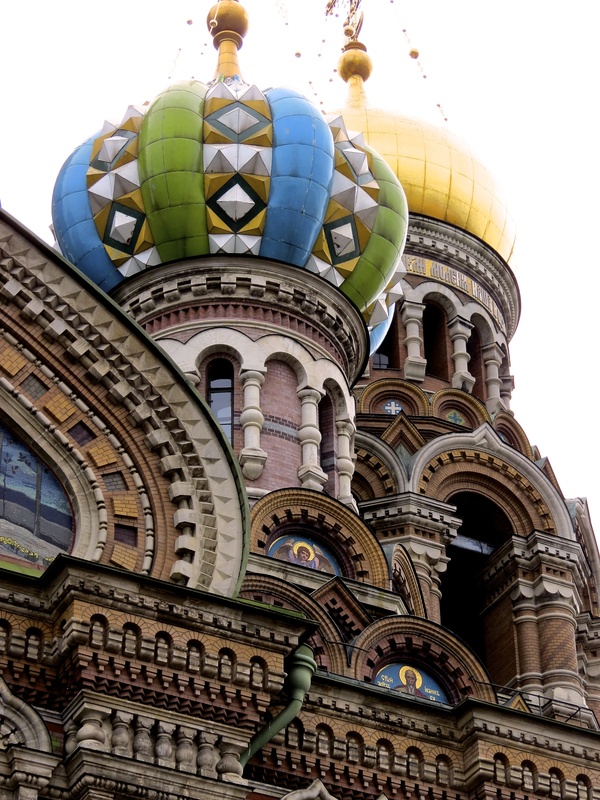 The Church of the Spilled Blood is visually recognizable by its ornate, colorful onion domes. I can’t say why I find them so appealing, I just find myself drawn to them. I wasn’t prepared to be so overwhelmed by the interior. The entire wall surfaces are covered in tiny mosaic tiles. It’s so difficult to comprehend the amount of work, time and planning that went in to the magnificent design. I’m at a loss for words to describe its beauty. 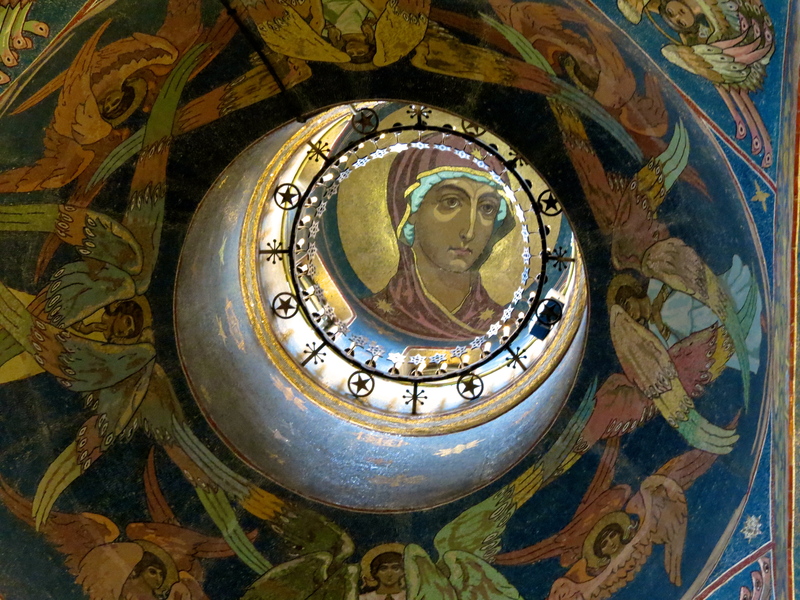 Looking up in the Church of the Spilled Blood. A figure is depicted inside each of the domes. 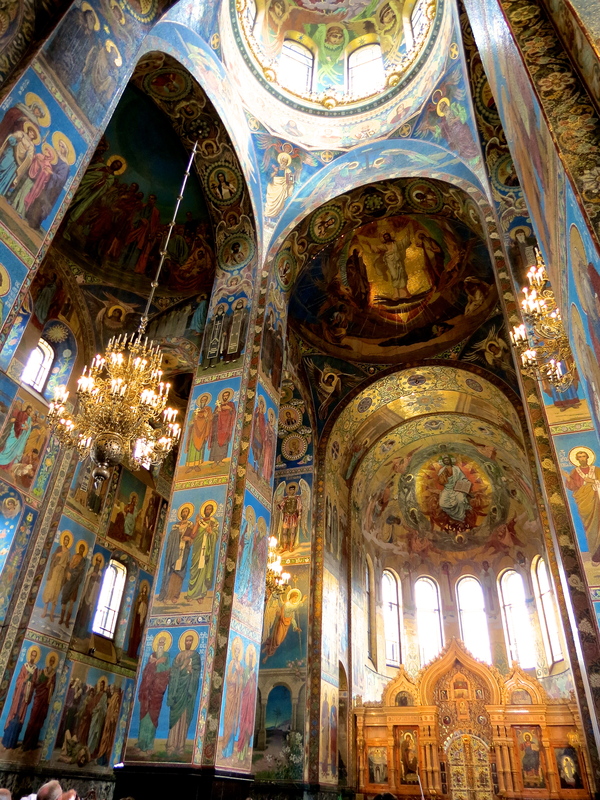 Church of the Spilled Blood. 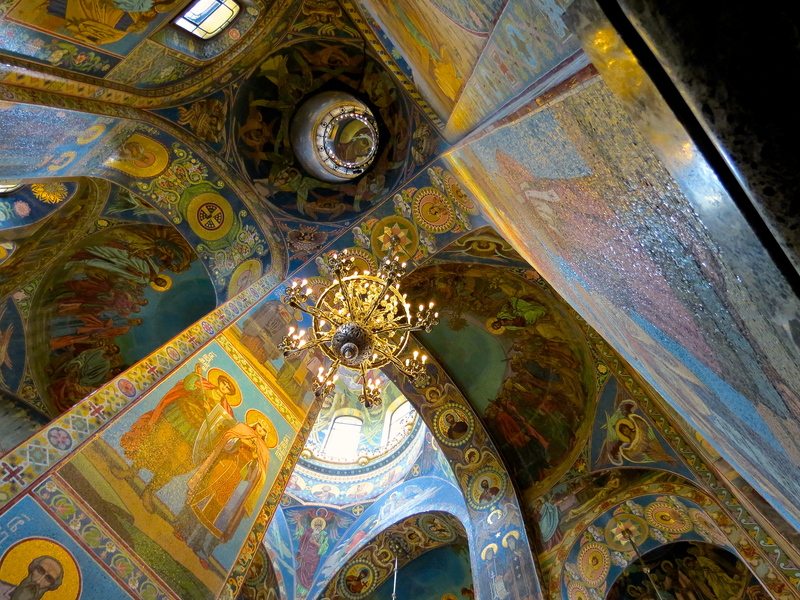 The Church of the Spilled Blood is one of the most magnificent places I’ve ever visited. The onion domes of the Church of the Spilled Blood. What an amazing day! I’m all out of adjectives to describe it all. I just feel so lucky and blessed to be able to have witnessed all this beauty first hand. It certainly brings new meaning to ‘trip of a lifetime’. And, we still had one more day in Saint Petersburg. 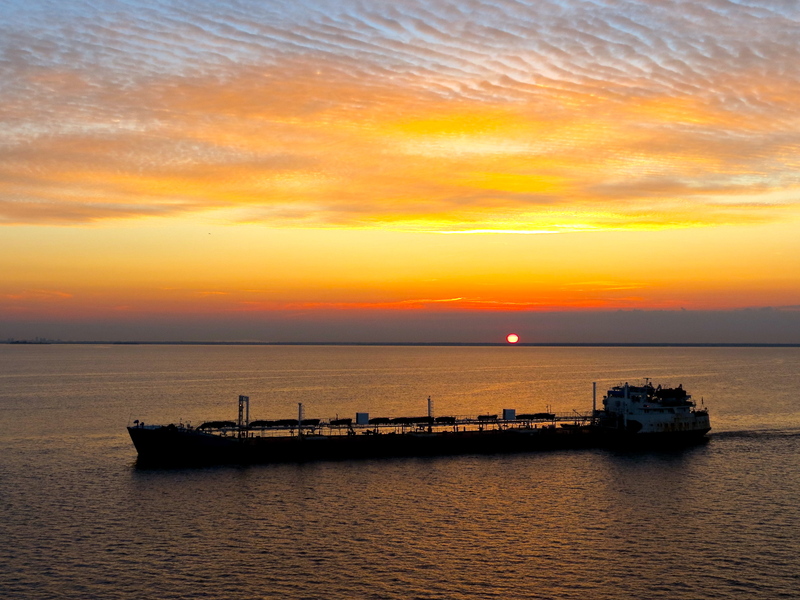 Russian Sunrise on the Baltic. 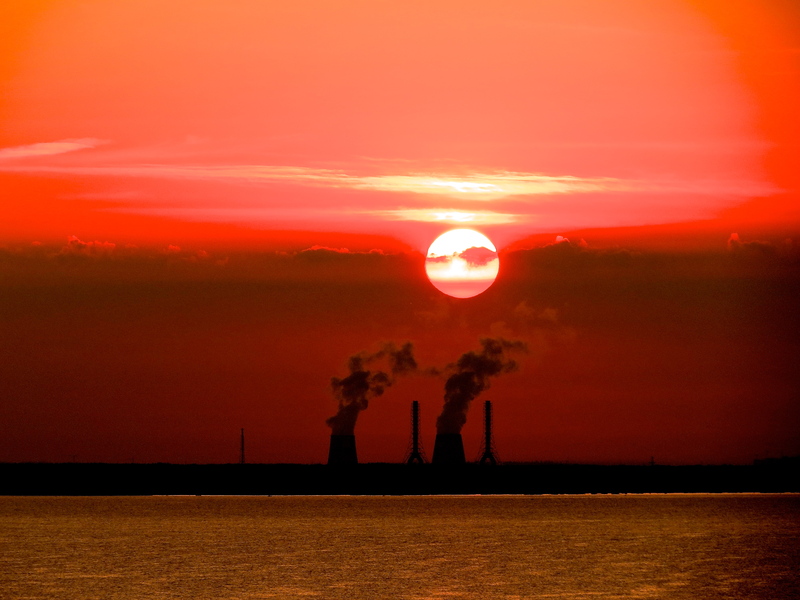 Ominous red sky at sunrise over Russia on the Baltic. We had a long day planned for our first day in Russia and I have to say I did have some apprehensions that morning that turned out to be of no real concern. 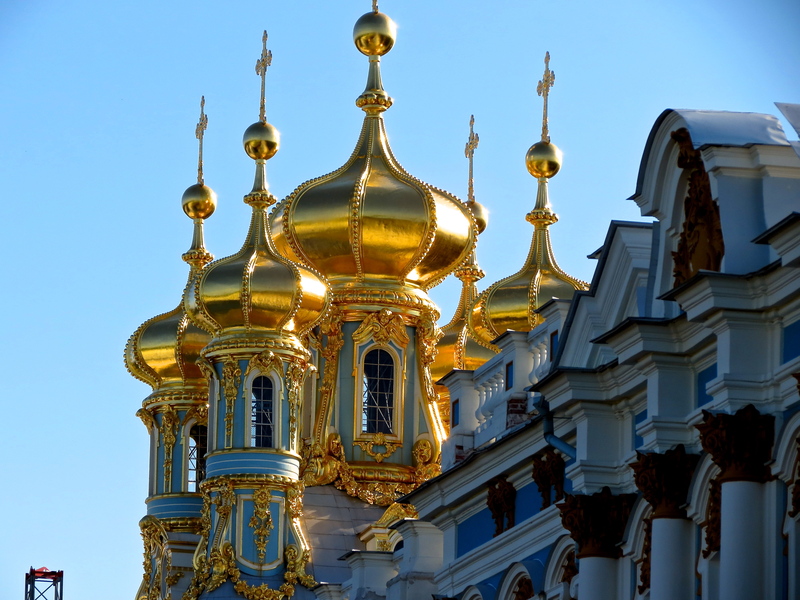 Onion domes of Catherine Palace. Before our trip, friends had expressed safety concerns to us about Putin’s anti-gay legislation, that also applied to travelers. That didn’t concern me nearly as much as my nervousness going through passport control. They talked a lot about it on the ship. And, as it turned out, it was no big deal. The first time you enter Russia through passport control, you give them a signed form (that had been filled out for us), your passport and show them your tour ticket.If everything is in order, they stamp your passport. When you leave, you give them your passport and another form and they stamp your passport again. After that, each time you come and go, you show them the stamps, they look at your picture and you go right through. No problem. We were told to be calm and patient and not to worry if we were scowled at… that’s how they are trained. I think we passed through (coming and going) about ten times in three days. I usually got smiles from the agents and found them less ‘scary’ than the NSA agents at American airports. One agent even told me I was skinny– looking at my old, unflattering passport photo. So our first day in Russia, we’d scheduled an eight-hour tour called “Classical Saint Petersburg“, as our introduction to the city. 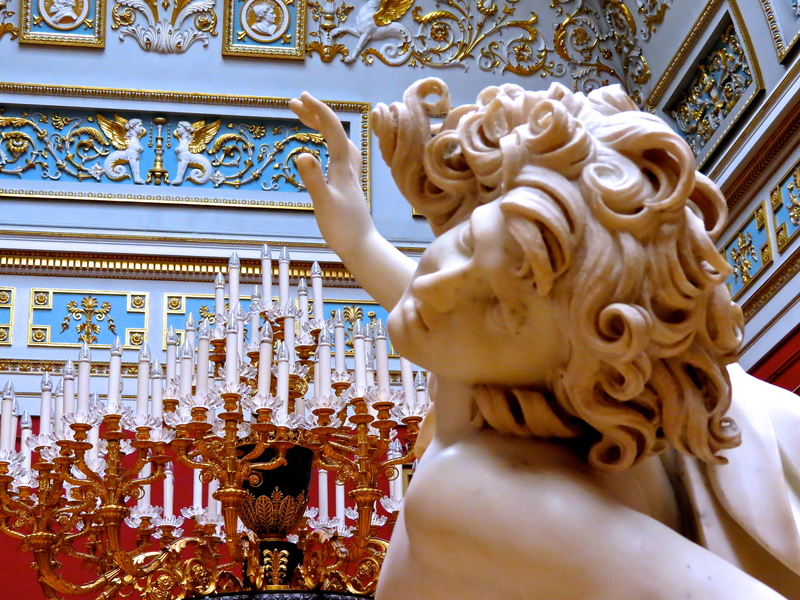 Our first major stop was actually outside of Saint Petersburg, at Catherine Palace in Pushkin. One of the nice things about all the tours was that we got in to the busier attractions an hour or so before they officially opened to the public. Most of our groups had around 20 to 30 people in them and we had listening devices so the guide could communicate with us without disturbing other visitors. 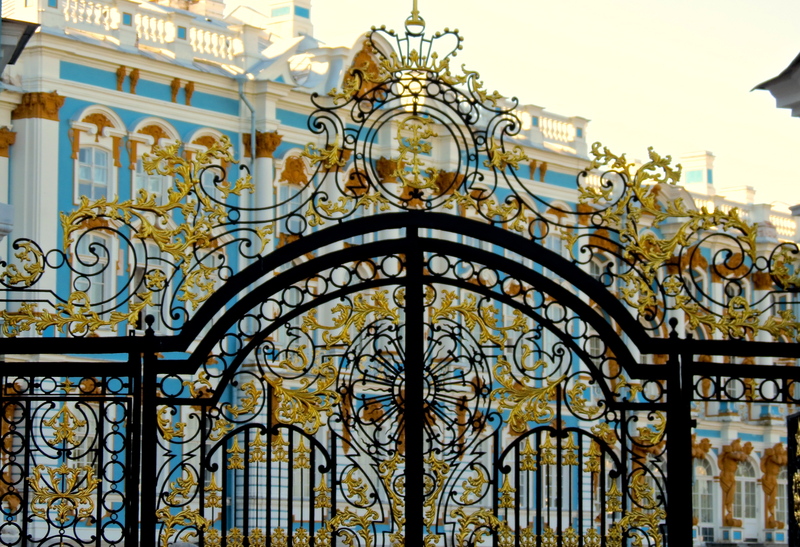 Catherine Palace, known as the summer palace, is simply massive. 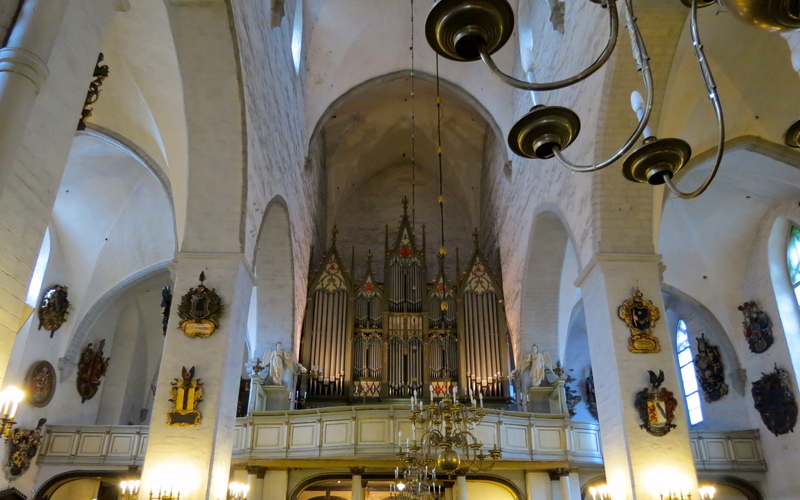 It was built in the early 1700’s and modified many times over the different reigns. As the Germans approached during World War II, many of the interior dressings, furniture and silk wall coverings were moved in to hiding, mostly in Siberia. The palace sustained substantial damage from the war and work continues, as funding is available, to return it to its former glory. Gold leaf adorns the walls in nearly every room, either as an accent or main design element. The amount of gold used is overwhelming. After the interior tour, we had some time to wander through the beautifully manicured gardens surrounding the palace. 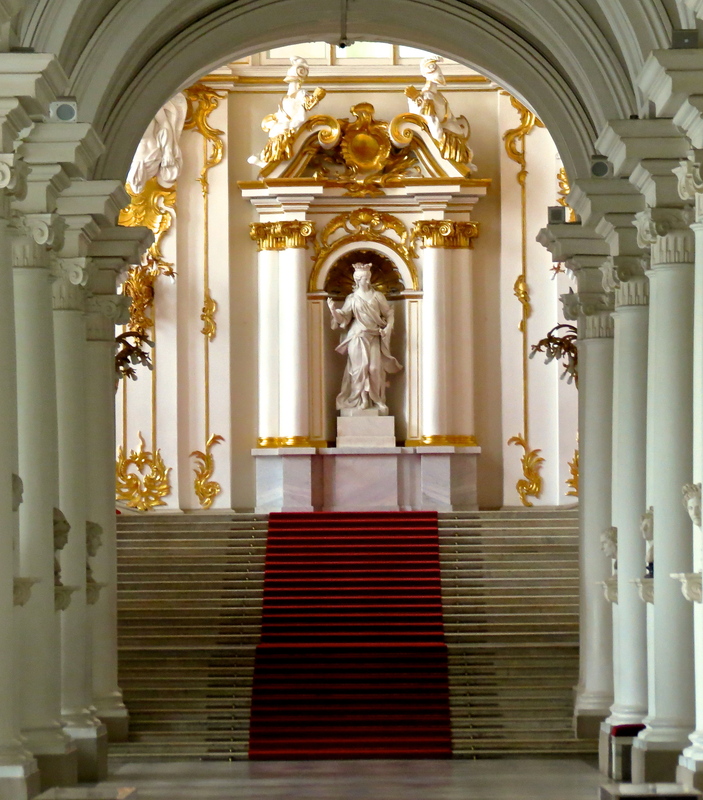 The Great Hall of Catherine Palace. Catherine Palace from the sculpted gardens. 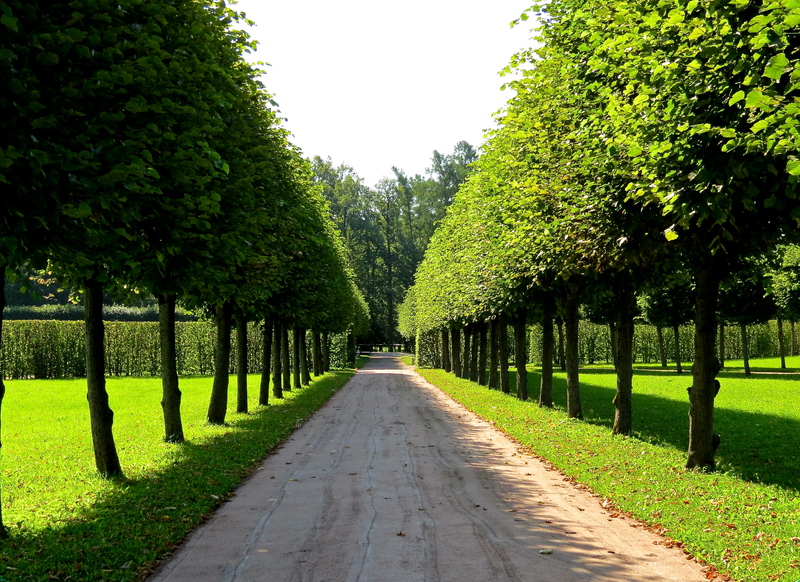 I fell in love with the many Linden tree paths leading away from the palace. 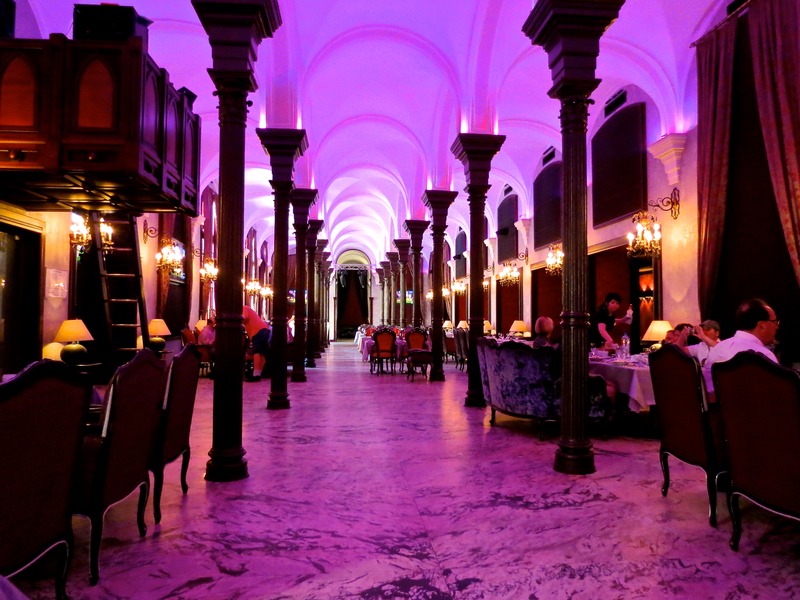 Restaurant interior in Saint Petersburg. We stopped for lunch at a beautiful restaurant, before continuing our tour. The meal was accompanied, traditionally, by champagne and a shot of vodka. I loved that the main dining room was surrounded by private dining booths that reminded me of the booths in the musical, Hello Dolly– which has nothing to do with Russia– but it’s something I’ve never seen in the United States. The meal was included with the tour and was a pleasant surprise. I couldn’t possibly share all the sites we saw throughout the rest of the day, so I’m trying to at least share the highlights. 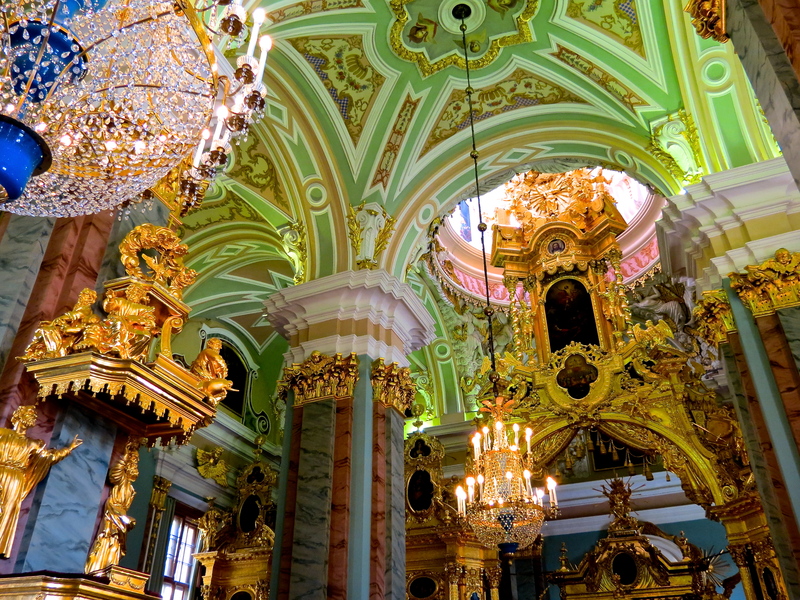 Saint Petersburg is such a beautiful city, it was obvious why we were spending three days there. We saw many historic buildings, statues and walked along the waterfront. We also had a chance to view the exteriors of many of the cathedrals we’d visit on a subsequent tour. 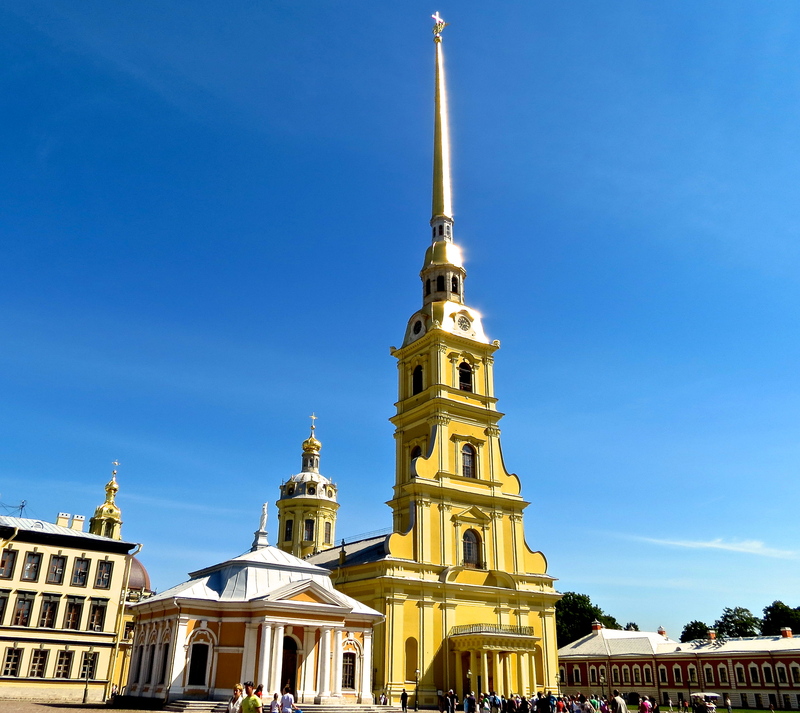 The Peter and Paul Fortress was our last major stop on the tour that day. It is considered one of the most important sites historically and structurally to the hub of the city of Saint Petersburg. The cathedral there gave us just a taste of what was in store for us the following day when we visited the great cathedrals of the city. The beauty of the stunning interior can’t fully be captured in photographs. 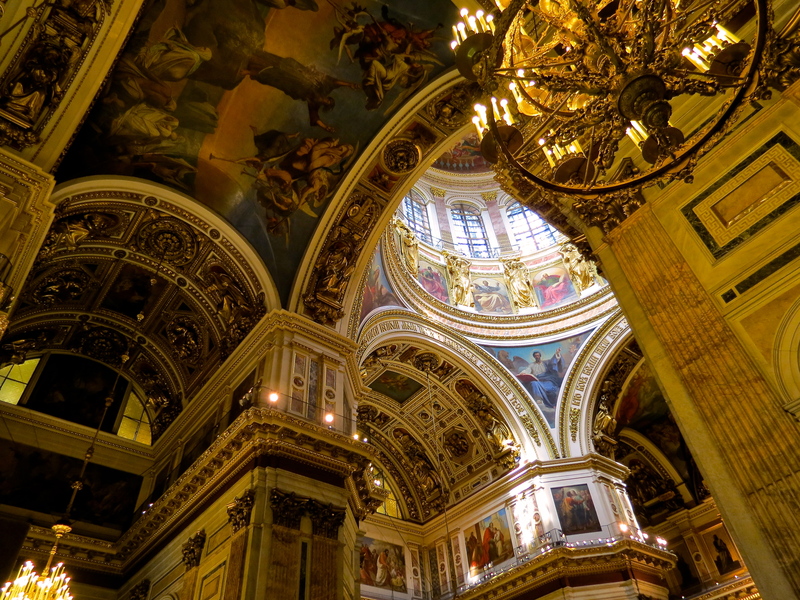 Inside the Peter and Paul Cathedral. After the tour, we had enough time to go back through passport control, board the ship, change clothes, disembark and re-enter Russia to attend a performance of the ballet, Swan Lake. It had already been a long day but since it was offered, how could we not attend an authentic Russian ballet performance? Well, the good things I can say are: I’ve seen a Russian ballet in Russia, the theater was beautiful and the orchestra was wonderful.